Worldwide Auctioneers moved their Texas auction from the Houston area to the Dallas area last year. 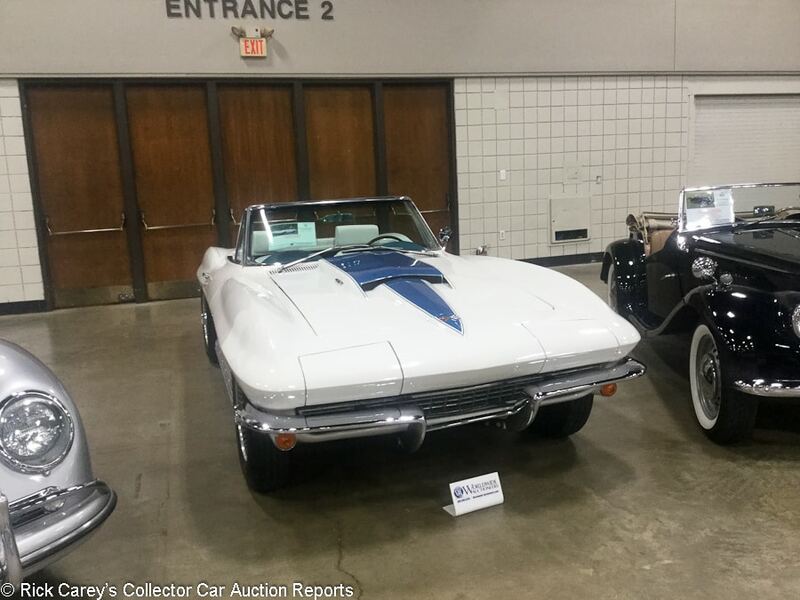 The auction is held in the Arlington Convention Center the day before the Concours d’Elegance of Texas held at the Richard Greene Linear Park adjacent to the Convention Center, the Texas Rangers’ Ballpark and the Dallas Cowboys’ AT&T Stadium. With 70% of the 2018 consignment guaranteed to sell, Worldwide’s eventual 94.6% sell-through for the entire sale took a still-impressive 81.8% sale rate of the other 33 lots. That was a far better performance than last year’s 78.4% sell-through which rested on a 65.7% sell-through of the 70 lots not in the Monical Collection. The sale total was down some 34% from 2017, largely attributable to a dearth of high value cars. Only 13 lots hammered sold on bids of $100,000 or more. The lots topped out with a 1965 Shelby Mustang GT350 sold for $363,000. 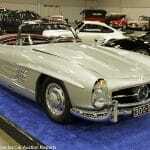 Last year’s top lot was a Mercedes-Benz 300SL that sold for $1,111,000. A transaction like that would have gone a long way to boosting the sale this year back into last year’s range. There are some very interesting cars in this year’s Texas Classic Auction, but most of them brought deserved modest prices. 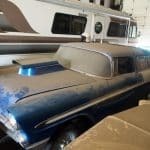 32 of the 111 lots hammered sold on bids of $10,000 or less making this a treasure trove for seekers of affordable access to the collector car hobby. Andrew Newton attended and wrote up the 51 detailed descriptions that follow; they were edited by me, and I remain responsible for the final content. Lot # 32 1980 American Motors Pacer D/L Hatchback Coupe; S/N A0A665C116092; Light Blue/Light Blue cloth; Unrestored original, 2 condition; Hammered Sold at $26,000 plus commission of 10.00%; Final Price $28,600. No Reserve. – 258/110hp six, automatic, wheel covers, narrow whitewalls, tinted glass, factory radio, woodgrain dash, power steering, power brakes, power locks. – From the Knies collection. Lightly scratched bumpers, very good, slightly faded original paint. Small dent in the driver’s door and a small scratch behind the driver’s window. A little dullness to some of the interior plastics but otherwise great interior. Showing 1,883 believable miles and it’s not perfect, but what did you do expect? It’s a Pacer, and this is about the best one you’ll ever find. 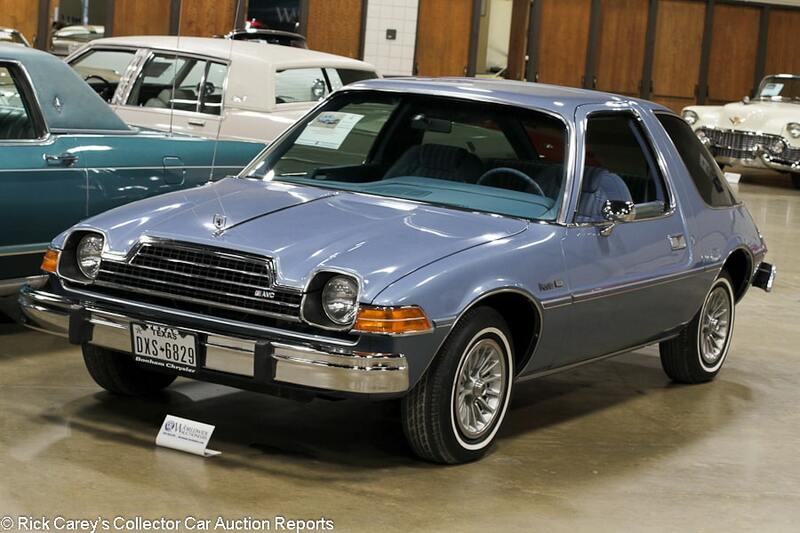 – Worldwide called it a record price on the block, but that’s not quite true since Barrett-Jackson sold the Wayne’s World Pacer back in 2016 for $37,400. Regardless, this is an astonishing price for a car that has essentially been a rolling punchline for most of its existence and has no movie history. 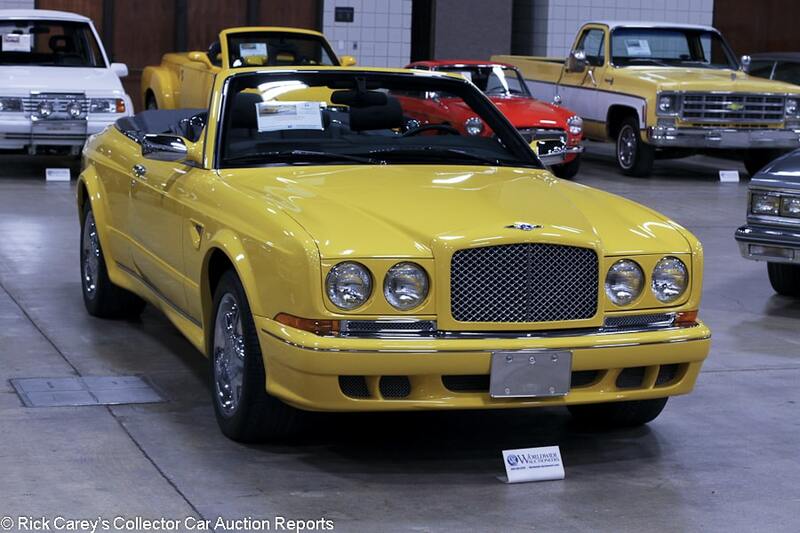 Lot # 47 2002 Bentley Azure Convertible Coupe; S/N SCBZK25E92CX01111; Yellow/Black leather; Black top; Unrestored original, 2- condition; Hammered Sold at $75,000 plus commission of 10.00%; Final Price $82,500. No Reserve. – Engine turned dash, CD stereo, air conditioning, burled walnut trim. – From the Knies collection. Some wrinkling to the driver’s seat and waviness to the console, but mostly really good interior. Good paint. Represented with just 2,318 believable miles. One of 78 built in 2002. Represented with recent service. – A pretty rare car that looks great with the wide body look even if the color isn’t for everybody, and still a status symbol even if it sold for a fraction of its original $365,000 MSRP. This is a fair result, even with the low miles. 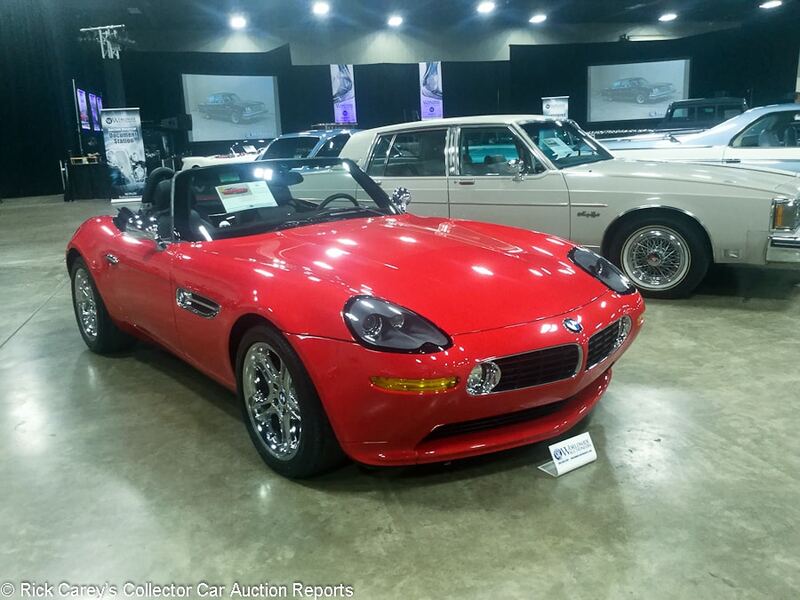 Lot # 61 2002 BMW Z8 Roadster; S/N WBAEJ134X2AH61669; Red/Black leather; Black cloth top; Unrestored original, 2 condition; Hammered Sold at $182,500 plus commission of 10.00%; Final Price $200,750. No Reserve. – Chromed wheels, Potenza tires. – From the Knies collection. Represented with 4,232 miles and rare but attractive colors. Other than light wear on the driver’s seat, it looks nearly new. It could use a more thorough detailing, however, particularly on the top, which shows a little dirt at the bottom margins. – The Z8 made the transition from used exotic to collector car around 2014-15, with values rising and surpassing the original $130,000 price. This result is straightforward and even a little light for an example with such low mileage. 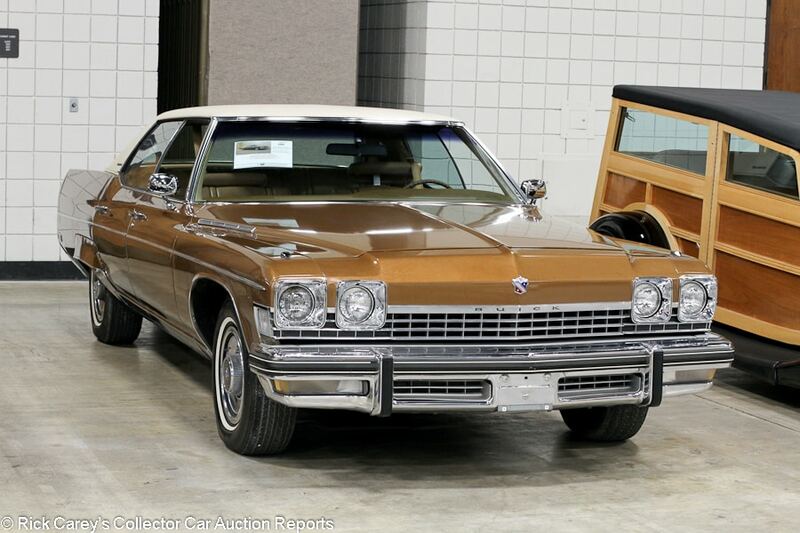 Lot # 105 1974 Buick Electra 225 Custom 4-Dr. Hardtop; S/N 4V39T4H490234; Brown, Beige vinyl roof/Brown vinyl; Unrestored original, 2- condition; Hammered Sold at $12,750 plus commission of 10.00%; Final Price $14,025. No Reserve. – 455/210hp, automatic, narrow whitewalls, power windows. – From the Knies collection. Several large paint chips on the trunk lid and significant fading on the hood, but the original paint is mostly good, more than good enough to keep as is. Fantastic original interior. There are some smudges on the roof vinyl but it’s mostly sound up there. Very tidy original underbody. These big Buicks are seldom seen these days, and this is one of the better all original ones out there despite its flaws. – This Big Buick’s survival is nearly miraculous and if I were the buyer I’d put it immediately in a container on a ship to Shanghai where Buicks are appreciated more than anywhere else on the earth and where a luxo-barge like this would have more face than a modern Mercedes. At this generous price that’s about all the new owner can hope for. 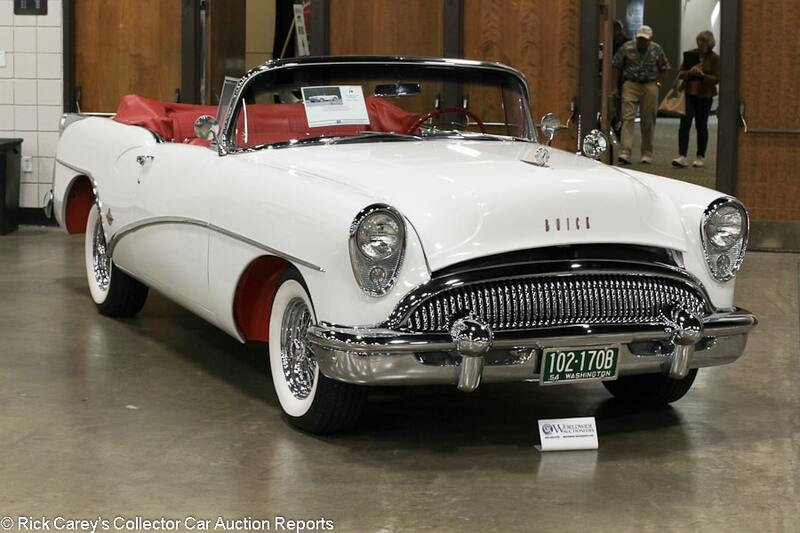 Lot # 18 1954 Buick Skylark Convertible; S/N 7A1082957; Arctic White/Red leather; Red top; Older restoration, 1- condition; Hammered Sold at $105,000 plus commission of 10.00%; Final Price $115,500. With Reserve. – 322/200hp, Dynaflow, chrome wire wheels, whitewalls, spotlight, dual mirrors, boot cover, Selectronic radio, dash clock. – Tiny chip on the right front fender. Very good paint, chrome and interior and there are no real flaws to pick on, but none of it is fresh. A show car with awards to prove it, but it was restored in the 1990s and it’s just starting to show its age a little. nevertheless, a ’54 Skylark is a very rare, gorgeous and highly collectible car, and this is still a really good one. – This Skylark was offered at Mecum’s Seattle auction in 2014 where it was reported bid to $130,000. It brought significantly less here, but is four years older. Even taking that into account, though, the result is favorable to the buyer by more than a few thousand dollars and is a good value. 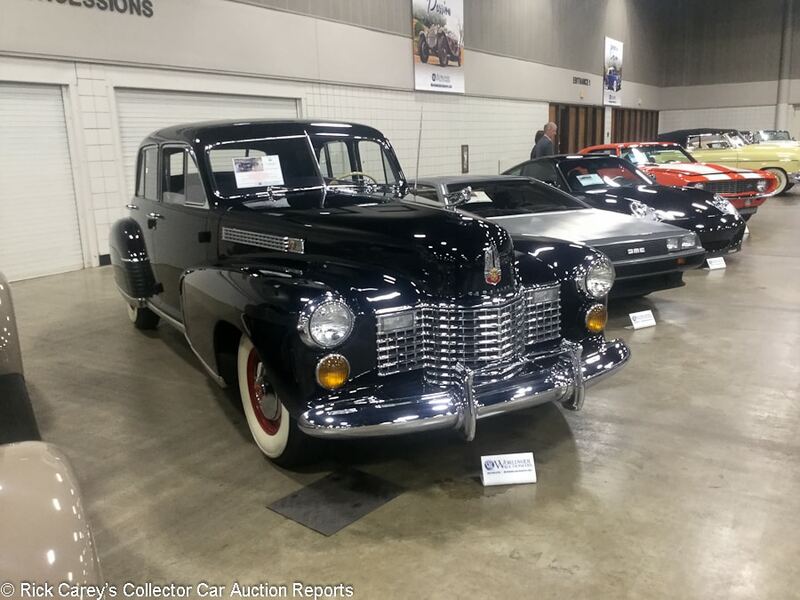 Lot # 30 1941 Cadillac 60 Special 4-Dr. Sedan, Body by Fleetwood; S/N 4494; Black/Gray cloth; Older restoration, 2- condition; Hammered Sold at $30,000 plus commission of 10.00%; Final Price $33,000. With Reserve. – 346/150hp, 3-speed, hub caps, wide whitewalls, fender skirts, column shift, dash clock, radio, wood dash and door trim. – Sound older paint and chrome. Light pitting on the grille and the vents in the hood. Even gaps. Very good interior. A very handsome older restoration that’s a CCCA Full Classic(TM). not quite at home on the show field, but eligible for that club’s many great events. 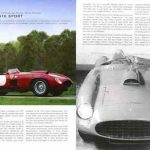 – Bill Mitchell’s 60 Special anointed him as the successor to Harley Earl at GM design, an accomplishment that the car’s style and design features more than justified. 1941 may have been the height of the model, with upgraded trim and features. This example is more than good enough in condition and it has style and class to spare. It is cheap for what it is. 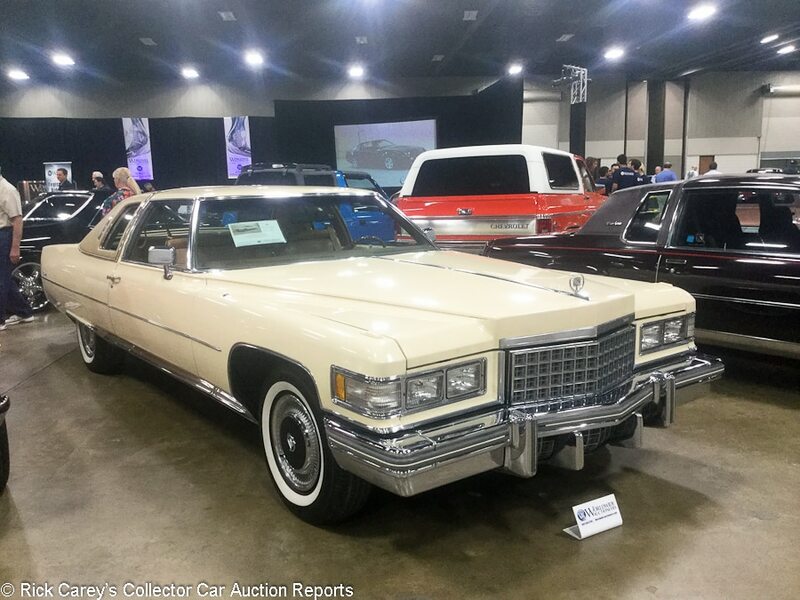 Lot # 45 1976 Cadillac DeVille Coupe; S/N 6D49S6Q299388; Beige, Tan vinyl roof/Tan leather; Unrestored original, 2- condition; Hammered Sold at $15,000 plus commission of 10.00%; Final Price $16,500. No Reserve. – 500/190hp, automatic, wheel covers, narrow whitewalls, hood ornament, tinted glass, power windows, air conditioning, pushbutton radio, woodgrain dash, fender skirts. – From the Knies collection. Light but noticeable wrinkling on the seats. Fairly tired paint and chrome, with light scratching on the bumpers and a blister right at the bottom of the vinyl roof. Tidy underneath. Very good roof vinyl. Showing 7,540 believable miles. Yet another car out of this collection that is impressively preserved and hardly driven, but nevertheless clearly not perfect. – Since the ’77 Coupe De Ville was downsized, the ’76 cars represents the end of an era but nevertheless aren’t exactly valuable. This result was about top dollar for one with this combination of condition and preservation. 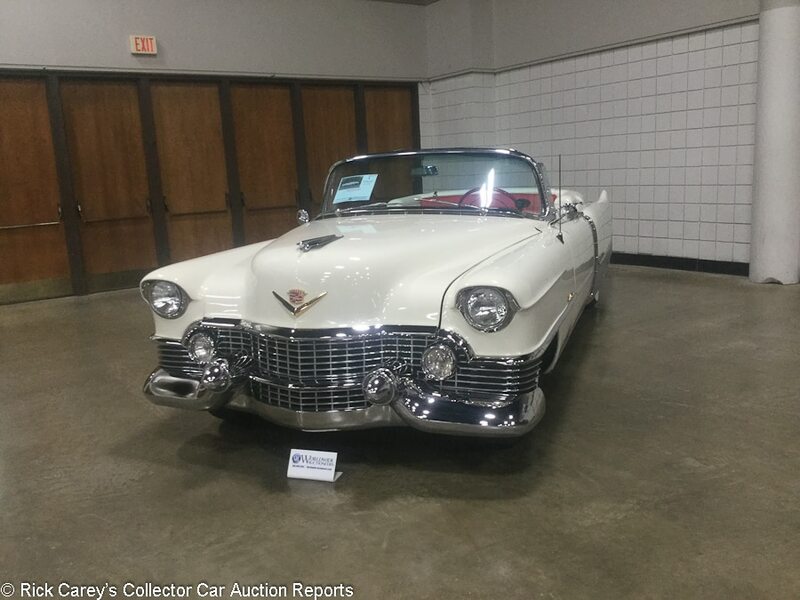 Lot # 2 1954 Cadillac Eldorado Convertible Coupe; S/N 546208241; Alpine White/Red, White leather; Older restoration, 2- condition; Hammered Sold at $108,000 plus commission of 10.00%; Final Price $118,800. With Reserve. – 331/230hp, automatic, chrome wire wheels, Goodyear whitewalls, fender skirts, parade boot, dual mirrors, pushbutton AM radio, dash clock, power windows, power top. – Very good recently detailed engine bay. Very good paint and chrome. Uneven door gaps. Light wrinkling to the seats but otherwise a great restored interior with little wear. The trim around the rear wheels is slightly beat up. Fully restored seven years ago and an inherently neat car with a lot of eyeball and great ’50s colors, but far from show-ready. – Sold by Leake in Dallas five months ago for $82,500 and turned here at a tidy profit that is all the money for the age of its restoration and condition. 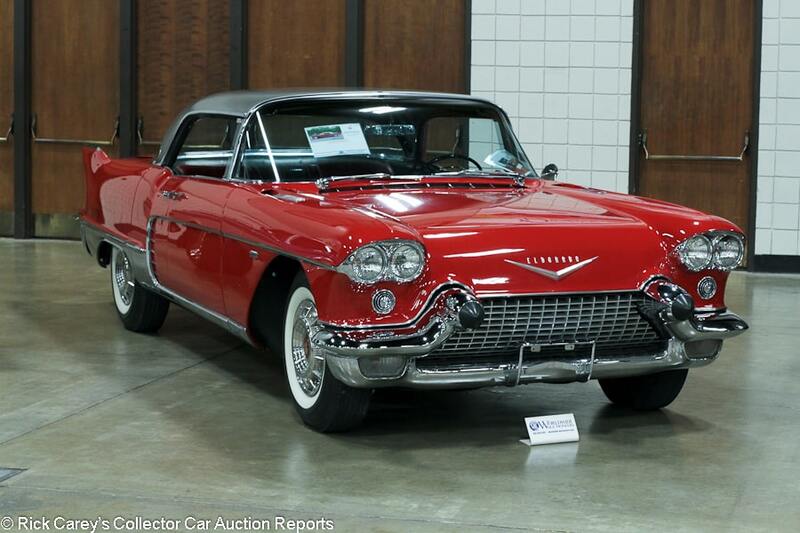 Lot # 31 1958 Cadillac Eldorado Brougham 4-Dr. Hardtop; S/N 58P017398; Dakota Red, Brushed Steel roof/Red leather; Older restoration, 3+ condition; Hammered Sold at $110,000 plus commission of 10.00%; Final Price $121,000. With Reserve. – 365/335hp, 3×2 barrel carbs, automatic, wheel covers, whitewalls, pushbutton radio, power windows, heater. – Some light scratching to the stainless steel roof. Uneven door gaps. Some detail scratching in the paint. Slightly dirty tires. Light wrinkling to the seats but mostly good interior. Restored and lightly used underneath. The rubber front bumper cones are a little dry and worn. Recently serviced but restored a long time ago, and a ’58 Brougham that really deserves to be presented better. – These cars are nearly completely hand-built, rarely similar from one to another, and endlessly expensive to restore which makes finding a competently older restored example in good condition like this is an opportunity even with its shortcomings that can be remedied largely by some attention with rags and potions and is a sound value at this price. 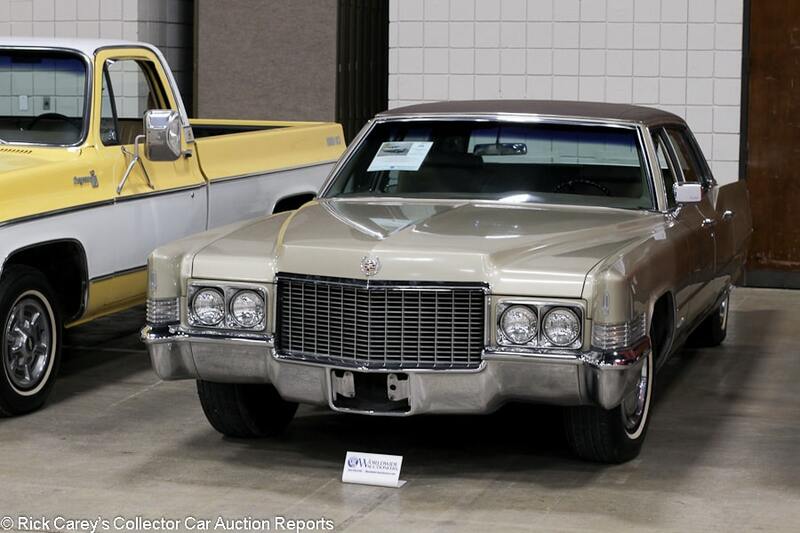 Lot # 104 1970 Cadillac Fleetwood 60 Special Brougham 4-Dr. Sedan; S/N P0261725; Sauterne Beige, Brown vinyl roof/Beige cloth; Unrestored original, 2- condition; Hammered Sold at $15,500 plus commission of 10.00%; Final Price $17,050. No Reserve. – Wheel covers, narrow whitewalls, power windows, air conditioning, pushbutton radio. – From the Knies collection. Really good original paint for the most part, but there are scratches here and there as well as some major discoloration on the trunk. Lightly pitted brightwork. Tidy underneath. Fantastic all original interior. Definitely not a showroom quality time warp car, but its flaws and age corresponds with the 24,222 miles and for the most part it’s a very impressive level of preservation. – A definite bargain considering the level of preservation, the style, the performance and the sheer size of this ’70 Brougham. It’s more desirable than many of the later malaise era luxury cars out of this collection but didn’t bring a lot more money. 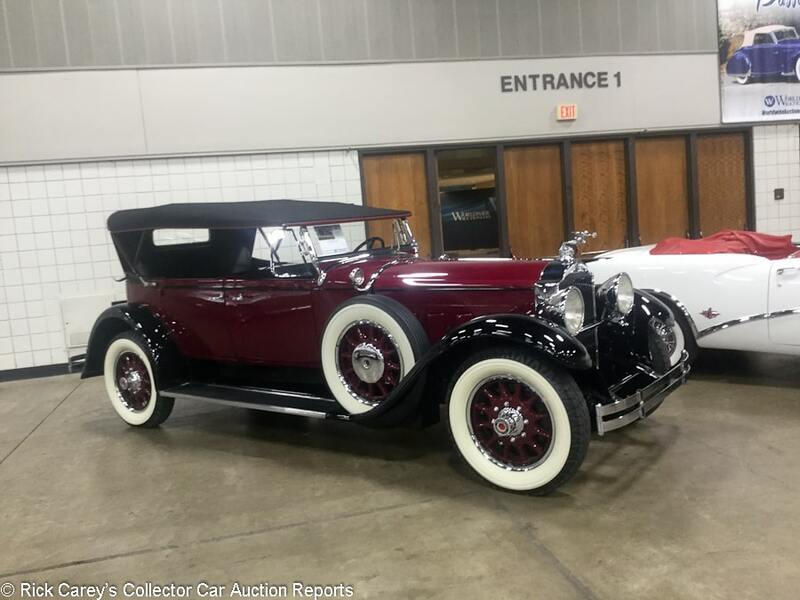 Lot # 9 1925 Cadillac V-63 Phaeton; S/N Engine No. 63G707; Engine # 63G707; Maroon, Black fenders/Black leather; Black vinyl top; Older restoration, 3+ condition; Hammered Sold at $55,000 plus commission of 10.00%; Final Price $60,500. No Reserve. – 314/80hp V8, 3-speed, varnished wood spoke artillery wheels, Silvertown blackwall tires, dual rear-mounted spares, Boyce MotoMeter, Elgin dash clock, luggage trunk. – Sound wheels. The paint is presentable but looks much older than the 2010 restoration it’s represented with. Lightly aged underneath. Very good upholstery, gauges, switchgear and top. A long way away from a concours car, but an honest old early V-8 Cadillac that’s not without its charm and eligible for all kinds of CCCA events. – Not sold at a $36,500 high bid at Leake Dallas a year ago, an opportunity missed. This is a much more appropriate price for a very good older restored Twenties Cadillac. It’s barely more than twice the price of a Model T Phaeton and is much more car, whether for a collector or for an owner who wants to drive on tours. Lot # 29 1957 Chevrolet Bel Air Convertible; S/N VC57B191607; Black/Red, Silver vinyl; White vinyl top; Older restoration, 3+ condition; Not sold at Hammer bid of $65,000. With Reserve. – 283/220hp, 3-speed, spinner wheel covers, whitewalls, factory AM radio, dash clock. – Fairly tired but presentable older paint and chrome. Light pitting on some of the brightwork. Very good fully restored interior. Lightly run underneath but sound. A handsome, honest older restoration of a reasonably well equipped ’57 Chevy. new paint would make a world of difference, although there’s nothing really stopping you from going out and enjoying it as-is. – And “as-is” is what the reported high bid reflects. This Chevy could have been sold for the reported high bid. The consignor is either going to spend some money on its presentation or take a bid like the one offered here for it in its present condition. Lot # 33 1972 Chevrolet C10 1/2 Ton Pickup; S/N CCE142S143011; Light Blue, White/Light Blue vinyl; Unrestored original, 2- condition; Hammered Sold at $13,000 plus commission of 10.00%; Final Price $14,300. No Reserve. – 350/175hp, automatic, trim rings, General white letter tires, Sony CD stereo, power brakes, power steering, air conditioning. – From the Knies collection. Showing 43,815 believable miles. The engine bay is a little dirty but well-kept for original. Tidy frame. Good older paint finish, although there are some masking errors around the windshield. The brightwork is original but good. Some rusty screws holding in the bed rails. The bed itself has some small dents from hauling but is mostly clean. Very good original interior. A handsome, honest and reasonably well equipped old C10. 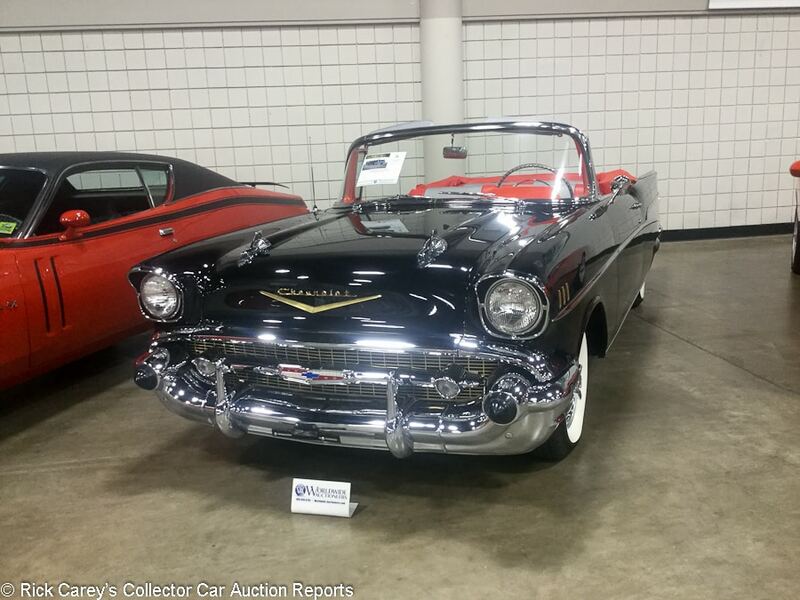 – Sold for $11,550 at Leake Tulsa in 2013. Interest in old trucks has surged considerably since then, which is reflected in this unsurprising result. 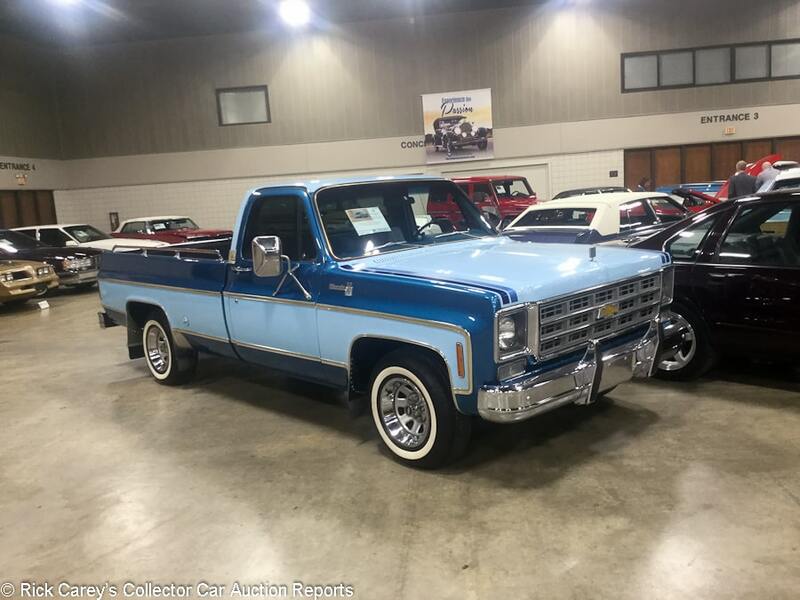 Lot # 57 1977 Chevrolet C10 1/2 Ton Fleetside Long Bed; S/N CCL147S145295; Blue, Light Blue/Light Blue cloth; Unrestored original, 2- condition; Hammered Sold at $10,000 plus commission of 10.00%; Final Price $11,000. No Reserve. – 350/165hp, automatic, trim rings, narrow whitewalls, spray-in bedliner, column shift, air conditioning, factory radio, woodgrain dash. – From the Knies collection. Clean, straight bed with recent spray-in bedliner. Very good, likely original paint with a few scratches on the front. Engine bay has some wear and oxidation but is tidy. Light rust on the bolts holding in the mirrors. Excellent original interior. A low mileage Texas truck that would need a few things to make it gorgeous but is mostly great for one that’s so original. 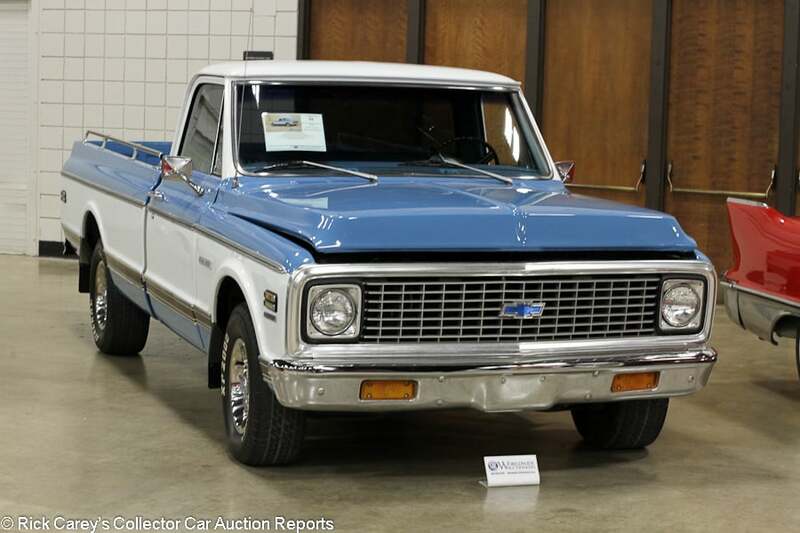 – A straightforward result for a truck that realistically could have brought more, but there were five other solid vintage C10s to bid on at this sale and this was not the pick of the litter. 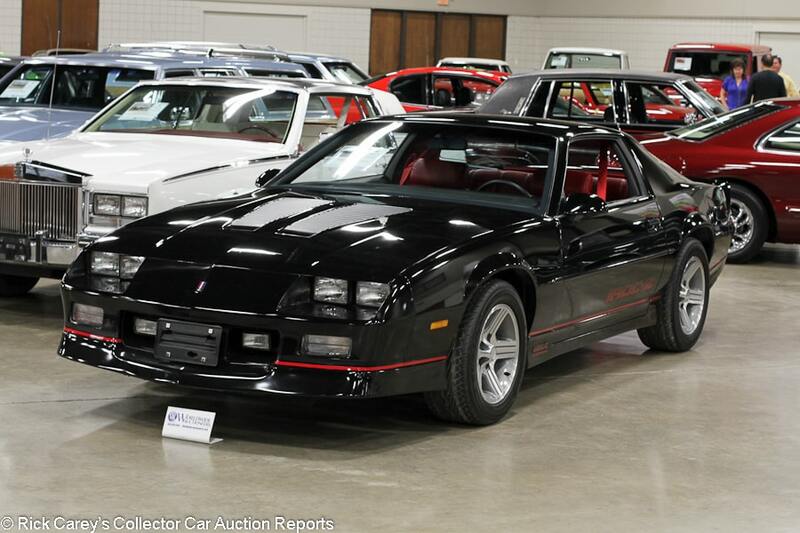 Lot # 65 1990 Chevrolet Camaro IROC-Z Coupe; S/N 1G1FP2386LL133859; Black, Red graphics/Red leather; Unrestored original, 2 condition; Hammered Sold at $21,000 plus commission of 10.00%; Final Price $23,100. No Reserve. – 350/245hp, automatic, alloy wheels, power windows, cruise control, cassette stereo. – From the Knies collection. Some odd paint blemishes on the hood but otherwise looks like a new IROC inside and out showing just 551 believable miles. – Destined for a life of static display given the mileage, and the premium price attracted by that mileage and preservation is straightforward and appropriate. 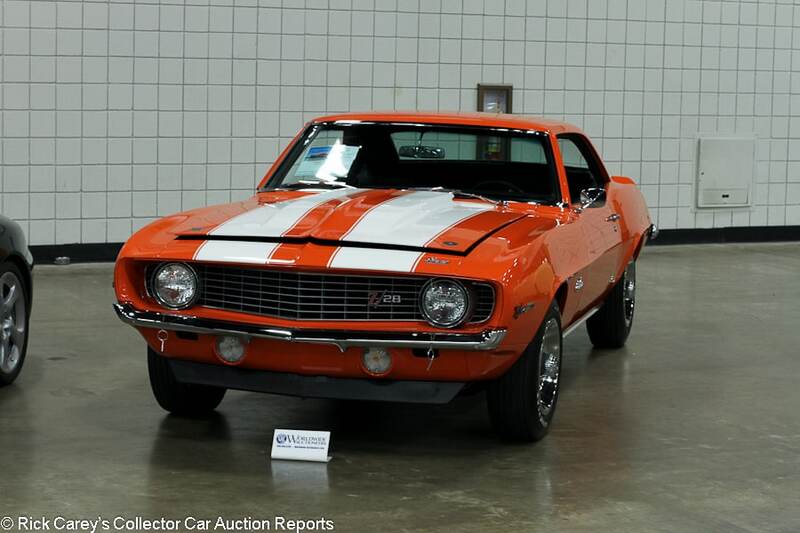 Lot # 17 1969 Chevrolet Camaro Z/28 2-Dr. Hardtop; S/N 124379N590547; Hugger Orange, White stripes/Black vinyl; Recent restoration, 2 condition; Not sold at Hammer bid of $95,000. With Reserve. – 302/290hp, 400hp with cross ram dual quads, Rally wheels, Wide Tread GT tires, M22 4-speed, cowl induction hood, 4.10 gears, hood pins, spoilers, Hurst shifter, radio delete, heater delete, fog lights. – Well equipped and represented as matching numbers and an original cross-ram, but the M22 4-speed is a correct replacement. Clean, lightly run engine bay. Very good paint and chrome. Factory gaps. Restored and like new interior other than a small crack in the console. Fully restored to high standards and with desirable equipment deletes. – Sold last year and 12 miles ago at Leake Dallas for $79,200, which was a really sweet deal considering it had previously sold at Barrett-Jackson Scottsdale in 2014 for $143,000. Values are down from that 2014 result, and this reported high bid that’s somewhere in the middle is also roughly appropriate and consistent with the reported high bid at Russo and Steele Monterey last August of $100,000. If the consignor here was the same buyer from last year in Dallas, the money offered would have made for a healthy profit if it had been taken. 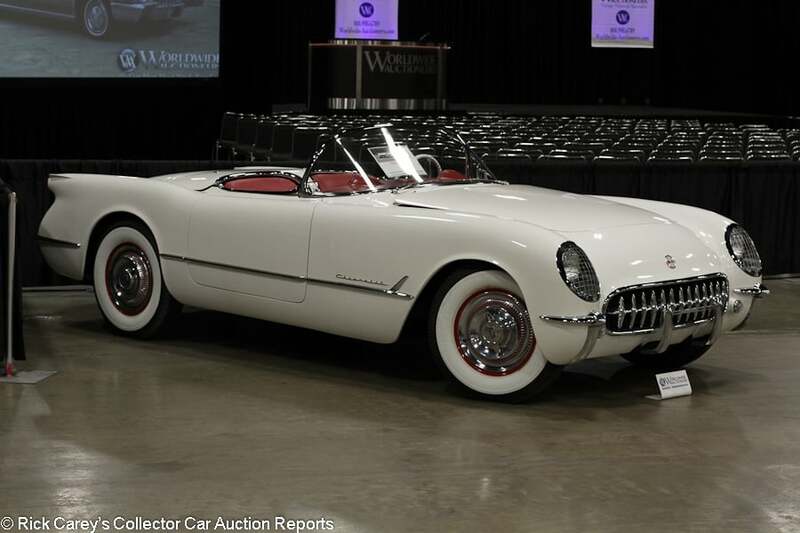 Lot # 8 1953 Chevrolet Corvette Roadster; S/N E53F001209; Polo White/Red; Recent restoration, 2+ condition; Not sold at Hammer bid of $230,000. With Reserve. – Spinner wheel covers, Firestone wide whitewalls, pushbutton radio. – Showing 4 test miles. number 209 of the 300 built in 1953. Spotless show quality engine bay. Fresh paint, chrome and interior. Every bit the recently completed show car it’s represented as and looks ready to take on the Corvette show circuit. – A ’53 this good and fresh deserves on the other side of a quarter-million. Typically, there aren’t many examples so recently completed on the market if there are any at all, so the consignor shouldn’t have too much of a hard time finding a more suitable number. 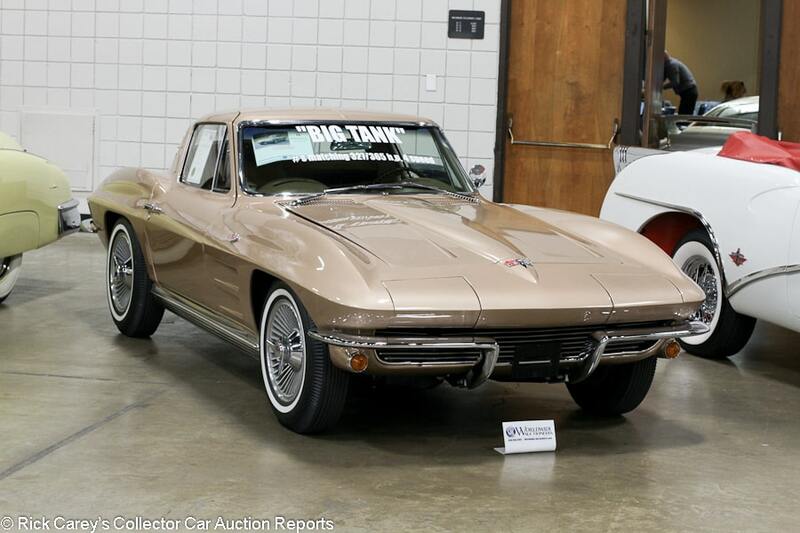 Lot # 14 1964 Chevrolet Corvette Coupe; S/N 40837S113944; Saddle Tan/Tan vinyl; Older restoration, 2- condition; Hammered Sold at $65,000 plus commission of 10.00%; Final Price $71,500. With Reserve. – 327/365hp L76 engine, 4-speed, centerlock alloy wheels, narrow whitewalls, 36-gallon tank. – Represented as matching numbers. Some light scratches on the front bumpers. Light scratches on the rocker trim. Lightly run but restored and correct engine bay. Some cracks on the weather stripping. Good paint other than a scuff at the back of the driver’s door by the window. not much in the way of documentation or ownership history represented, but a solid restored example of a car with very desirable equipment. – Not sold at a $68,000 high bid at Russo and Steele Scottsdale last year and similarly bid here to another offer that’s not generous but was fair. The bidders have spoken speaking and the seller was well-advised to listen. Lot # 21 1967 Chevrolet Corvette 427/435 Convertible; S/N 194677S107302; Engine # 7107312; Ermine White, Blue stinger/White vinyl; Blue vinyl top; Older restoration, 2- condition; Hammered Sold at $125,000 plus commission of 10.00%; Final Price $137,500. With Reserve. – 427/435hp, 4-speed, reproduction turbine wheels, red line tires, side exhaust, power brakes, power windows. – Matching numbers. NCRS Top Flight in 2002. Clean, lightly run engine bay. Very good older paint. The chrome is showing its age a little but is still quite good. Light discoloration to the seats and some dullness to the switchgear. Rare, attractive colors and desirable equipment, just starting to show a little general wear. not a show car, but needs nothing and is still an attention-grabber. – Sold at the Leake Dallas auction in 2013 for $99,000 and offered two months later at Mecum Kissimmee where it was reported bid to $125,000, the same hammer bid that bought it here and a sound result given its desirable equipment and the restoration’s evident quality and preservation. 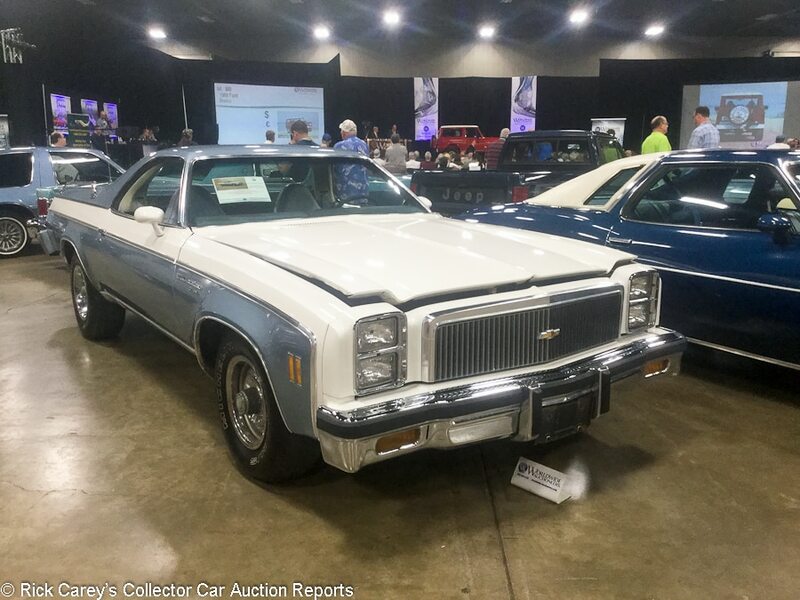 Lot # 39 1977 Chevrolet El Camino Pickup; S/N 1D80L7R470237; Light Blue, White/Light Blue vinyl; Visually maintained, largely original, 3- condition; Hammered Sold at $6,000 plus commission of 10.00%; Final Price $6,600. No Reserve. – 350/170hp, automatic, Rally wheels, Michelin tires, factory air conditioning, AM/FM radio, factory swivel bucket seats. – From the Knies collection. Rough but complete engine bay. Scratched up bumpers. Good paint, which is represented as original, but that’s hard to believe given the condition of the rest of the car. Surface rust and oxidation on the wheels and chassis. Rough interior with huge rips in the driver’s seat, dirty carpets and scratches in the dash top. Showing 42,531 believable miles. A mostly ratty old El Camino hidden under good paint. – It’s hard to say what to do with this car, since it’s not really valuable or interesting enough to put much money for restoration into, but it’s also not really all that presentable as is. That conundrum was reflected in the bids, which were understandably light. 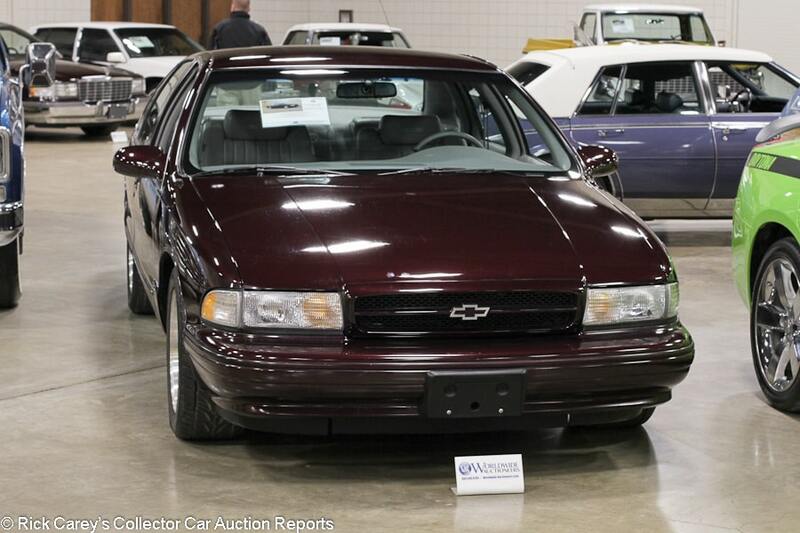 Lot # 58 1995 Chevrolet Impala SS 4-Dr. Sedan; S/N 1G1BL52P9SR160277; Dark Cherry Metallic/Gray leather; Unrestored original, 2- condition; Hammered Sold at $22,000 plus commission of 10.00%; Final Price $24,200. No Reserve. – 350/260hp, automatic, power windows, air conditioning, alloy wheels, CD stereo, power seats, power windows. – From the Knies collection. Represented with 6,951 believable miles. Lots of detail scratches in the paint. Some flatness on the seats. Otherwise well-kept but really could be better given the extremely low mileage. – A collector-quality car in terms of its mileage even if its condition is a little disappointing up close. These LT1-powered sleepers have caught a following over the last few years, so while this would have been crazy money in 2014 or 2015, its roughly appropriate to this car’s condition today. 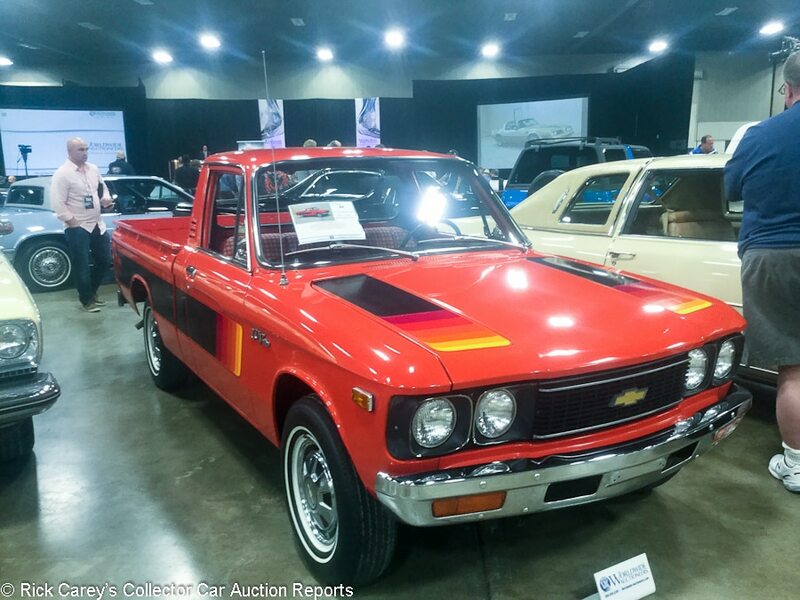 Lot # 44 1977 Chevrolet LUV 1/2 Ton Pickup; S/N CLN1468229785; Orange, Black/Red, White pattern cloth; Unrestored original, 2- condition; Hammered Sold at $13,750 plus commission of 10.00%; Final Price $15,125. No Reserve. – 111/80hp four, automatic, wheel covers, narrow whitewalls, floor shift, factory AM/FM radio, ‘Mighty Mike’ decal package. – From the Knies collection. The paint in the bed is a little faded, but the bed itself isn’t beat up. Good and only very lightly faded paint on the body. Long scratch in the graphic on the left side of the hood and touch ups at the back of it. Very good interior. Very good underneath. Showing 13,027 believable miles. A really charming little ’70s truck, and especially tempting if your name just happens to be Mike. – The Chevrolet LUV was actually a rebadged Isuzu introduced to the American market in the ’70s as a response to the influx of small Japanese pickups. They’re easy to forget, since vehicles like this were bought for work and used up, so nobody at the Worldwide auction had likely seen one for a couple of decades at least. This pretty big result was a testament partly to its preservation but mostly to its charm, especially in these very ’70s colors. 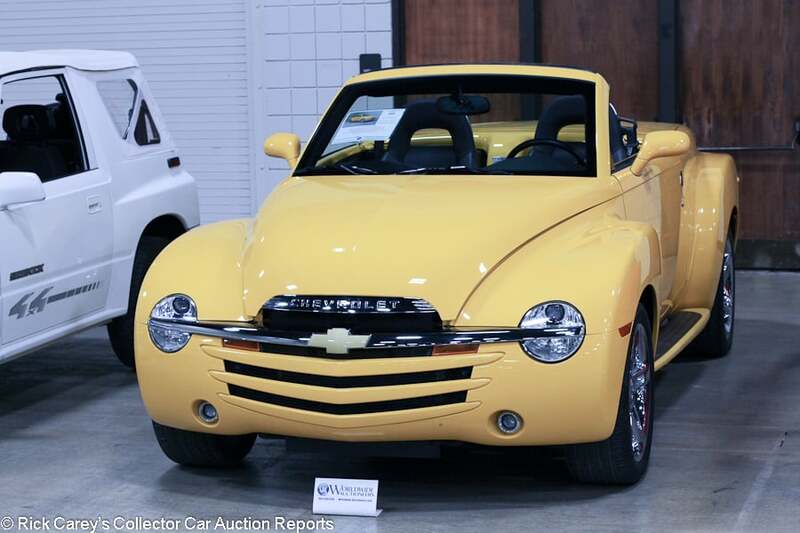 Lot # 102 2006 Chevrolet SSR Pickup; S/N 1GCES14H86B123581; Yellow/Black leather; Unrestored original, 2 condition; Hammered Sold at $40,000 plus commission of 10.00%; Final Price $44,000. No Reserve. – Chromed wheels, 6-speed, power seats, CD stereo. – Just 1,341 believable miles represented and essentially like new. – The first year 2004 SSRs were pretty much just a gimmick, but GM got serious the following year by fitting it with the LS2 out of the Corvette and an available Tremec 6-speed. The color, configuration and mileage makes this one a prime example and it brought a really strong price compared to other ones on the market, but this result still wasn’t any more than it cost new and notably less than the $50,600 it sold for at B-J WestWorld in 2011. 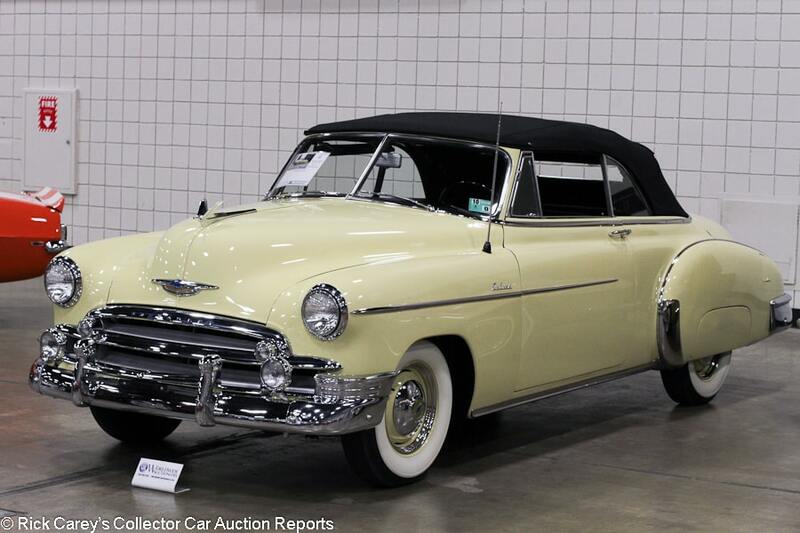 Lot # 12 1950 Chevrolet Styleline Deluxe Convertible; S/N L2491; Light Yellow/Black leather with White cloth; Black cloth top; Older restoration, 2- condition; Hammered Sold at $38,000 plus commission of 10.00%; Final Price $41,800. No Reserve. – 217/92hp six, 3-speed, hub caps and trim rings, wide whitewalls, fender skirts, hood ornament, pushbutton radio, dash clock, fog lights, heater. – Very good and well-kept older paint and chrome. Clean, straight-fitting top. The door gaps are slightly uneven. Light cracking in the speedometer lens and light wear to the leather, but mostly good interior. Restored in 1996 but looks much fresher than that. A charming, well equipped car with a lot to like even if was done a while ago. – The Mecum bidders nailed this Chevy’s value, paying neither more nor less than it should have brought. It’s a sweet – and even rare – car presented in very good condition, a terrific cruiser with the top down or closed up in foul weather. 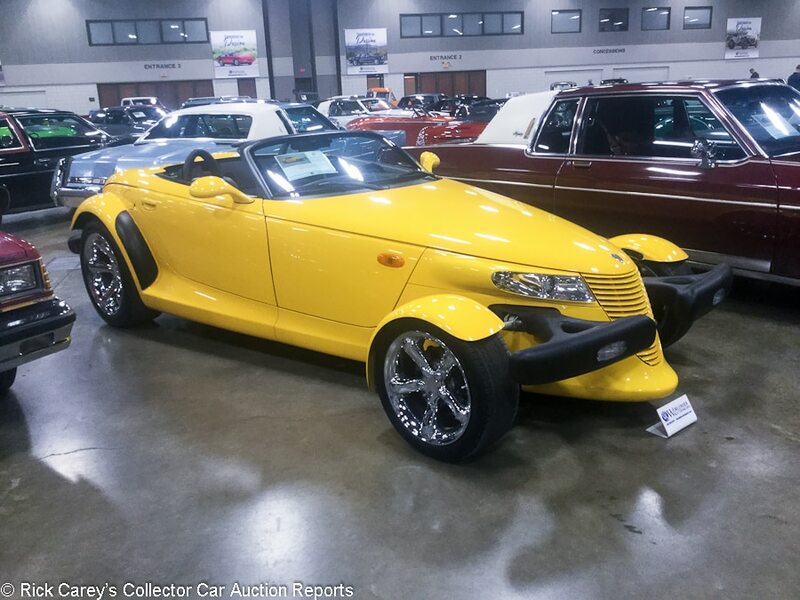 Lot # 87 2002 Chrysler Prowler Convertible; S/N 1C3EW65G72V101169; Yellow/Black leather; Unrestored original, 2 condition; Hammered Sold at $28,250 plus commission of 10.00%; Final Price $31,075. No Reserve. – Power windows, air conditioning, chromed wheels. – From the Knies collection. Showing just 1,330 miles and, aside from almost inevitable light wrinkling to the driver’s seat, looks just about showroom fresh. – After the Plymouth brand was axed, the last few Prowlers were sold as Chryslers. They’re essentially the same car and are worth about the same, though. The low mileage on this car was impressive, but Prowlers aren’t all that old and a lot of them weren’t driven very much, so the bidders only offered up a roughly average price. 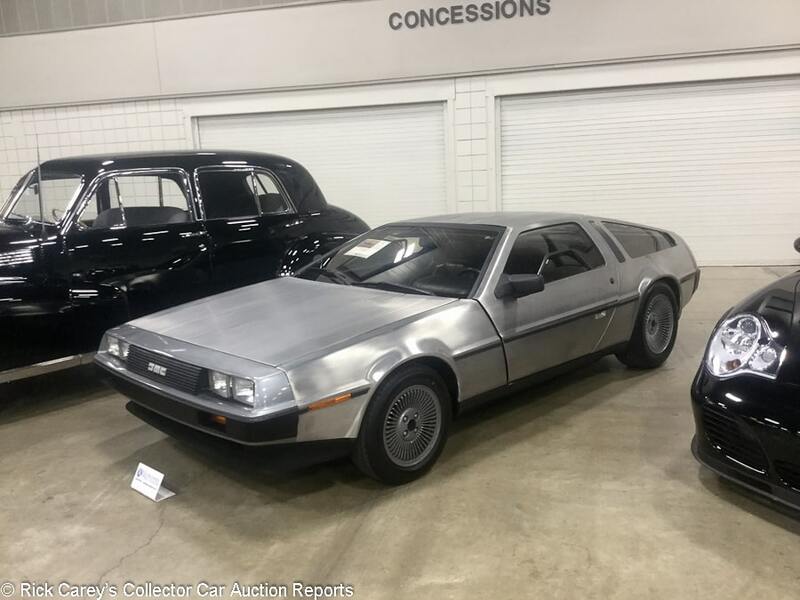 Lot # 20 1981 DeLorean DMC-12 Coupe; S/N SCET0T26T4BD00117; Stainless Steel/Black leather; Visually maintained, largely original, 3 condition; Hammered Sold at $19,000 plus commission of 10.00%; Final Price $20,900. No Reserve. – Power windows, factory radio, air conditioning. – Represented with new leather and recent thorough mechanical sorting. The body is decent but there are several light scratches as well as some small dents in the roof. Small touch up on the rear bumper. The switchgear is a little dull and the interior smells musty. The door struts work well. Showing 38,407 believable miles and pretty much all original, but there are plenty of original DeLoreans out there that are better than this. – This result is probably less than the consignor was hoping for given some of the recent work that’s gone into the car, but this is nevertheless just a mediocre example and the bidders understandably give it much attention. This was a reasonable result. 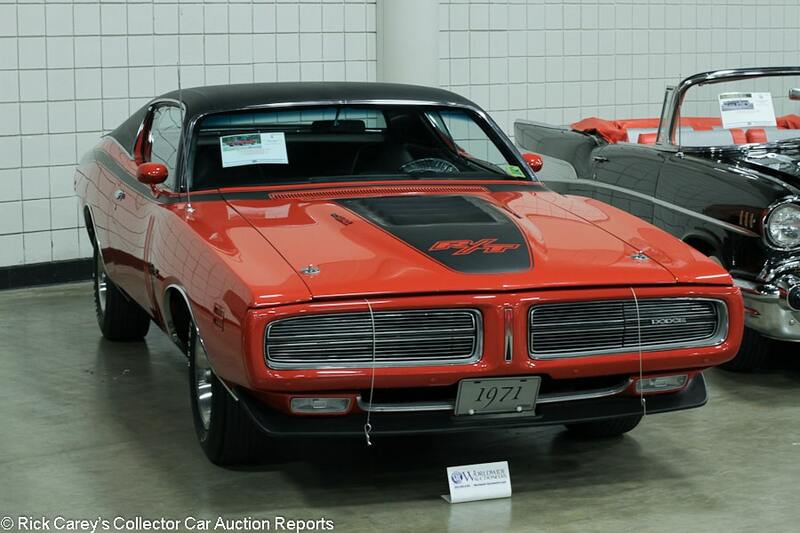 Lot # 5 1971 Dodge Charger R/T 2-Dr. Hardtop; S/N WS23V1A139475; Rally Red, Black stripes, Black vinyl roof/Black vinyl; Older restoration, 2 condition; Hammered Sold at $74,000 plus commission of 10.00%; Final Price $81,400. With Reserve. – 440/385hp Six Pack, 4-speed, Polyglas GT tires, hood pins, spoilers, Hurst pistol grip shifter, Track Pack with 3.54 gears, power steering, power brakes, power windows, tinted glass, louvered hood. – There is a light scratch at the front of the hood but very good paint otherwise. Factory gaps. Clean, straight roof vinyl. Very good interior. Fully restored in the early 2000s, but well-kept and put on display in Sweden (of all places) from 2003-17, so it’s hardly been used. 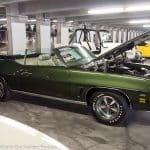 – Dodge had already dialed back the rated horsepower of the V-code Six Pack 440 in 1971, shaving it by a mere five horsepower before the draconian changes to come in 1972. The change made little difference and these cars are highly desirable, especially when restored and maintained in the very good condition of this one. The price it brought makes perfect sense with this equipment and it will be a delight to take out for a weekend’s cruise or joy ride. A sound value. 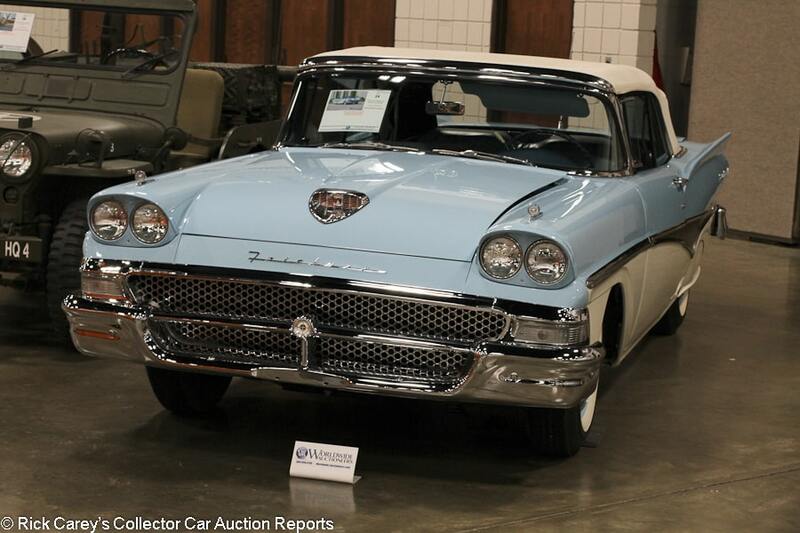 Lot # 24 1958 Ford Fairlane 500 Sunliner Convertible; S/N H8RC132616; Azure Blue, Colonial White/Light Blue, Dark Blue; White vinyl top; Older restoration, 2 condition; Hammered Sold at $35,000 plus commission of 10.00%; Final Price $38,500. No Reserve. – 352/300hp, automatic, wheel covers, whitewalls, fender skirts, pushbutton radio, power steering, power brakes, boot cover, heater. – Very clean fully redone engine bay and underbody. Very good paint and chrome. The headlight bezels don’t quite fit straight. Even gaps. Clean, straight top. Gorgeous interior. Fully restored to high standards and looks very fresh even though it was displayed in a museum for 22 years. – The bidders may have been put off by the restoration’s age because this result is nothing but a bargain. 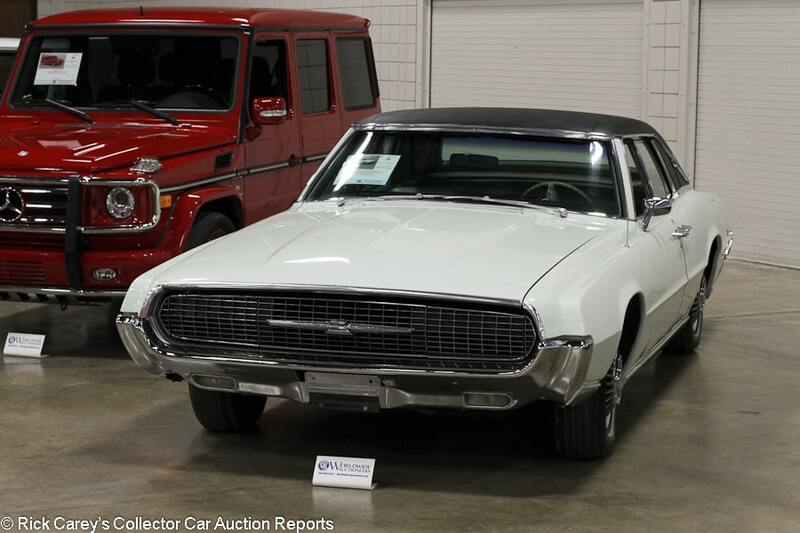 Lot # 34 1967 Ford Thunderbird Landau Sedan; S/N 7Y84Z169938; Diamond Green, Black vinyl roof/Light Green vinyl; Visually maintained, largely original, 3 condition; Hammered Sold at $13,000 plus commission of 10.00%; Final Price $14,300. No Reserve. – 390/315hp, automatic, spinner wheel covers, narrow whitewalls, power windows, air conditioning, pushbutton radio. – From the Knies collection. Decent older paint with some crazing as well as a little overspray in the wheel wells. Light road wear underneath. Lightly pitted and scratched door handles. Some body work done on the left rear corner, possibly from a light collision. Good possibly replacement roof vinyl. Lightly worn and presentable but a little musty interior. Essentially just a used car, although the level of preservation is commendable given its age. – The fifth generation T-Bird is somewhat unloved, and this is far from an ideal example even if it isn’t terrible, but it nevertheless brought strong interest and a big price relative to what similar cars have sold for. It is an economical conversation piece if nothing else. 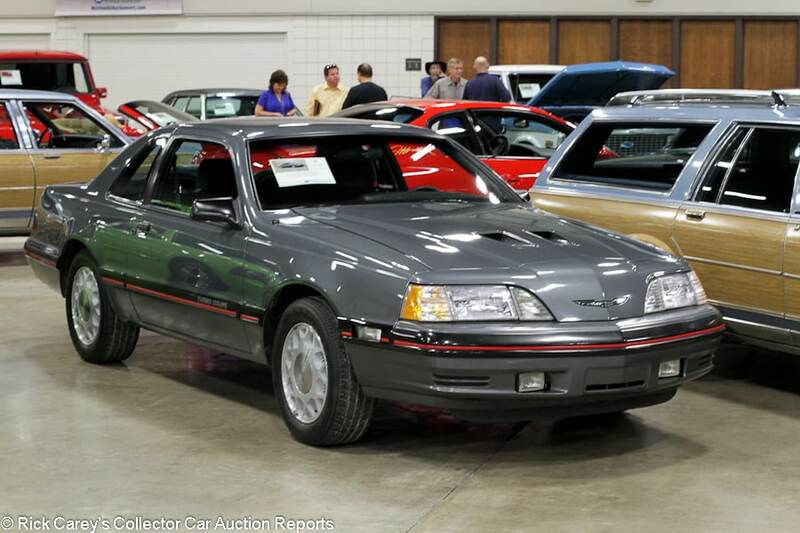 Lot # 62 1987 Ford Thunderbird Turbo Coupe; S/N 1FABP64W6HH114173; Gray/Dark Gray, Light Gray cloth; Unrestored original, 2 condition; Hammered Sold at $7,000 plus commission of 10.00%; Final Price $7,700. No Reserve. – 2.3/190hp turbocharged four, 5-speed, power seats, power windows, cassette stereo, alloy wheels. – From the Knies collection. Showing just 10,061 believable miles, but the paint on the front bumper is a little dull and there are some chips on the driver’s door handle, plus there is some road wear underneath. nevertheless, you could go for years without seeing another one of these and this one is mostly fantastic. – Not all of the T-birds of this era were bland, at least not underneath. Powered by the 2.3-liter turbo out of the Mustang SVO, albeit with a bit less horsepower, the Thunderbird Turbo was the top of the range model in 1987 and won that year’s Motor Trend Car of the Year award. Substantially less coveted than the Mustangs of the era that were also built on the Fox platform, this car sold for about half what an SVO Mustang with similar mileage might expect to bring, even though it’s considerably rarer, arguably more interesting and a fun driver with the 5-speed. 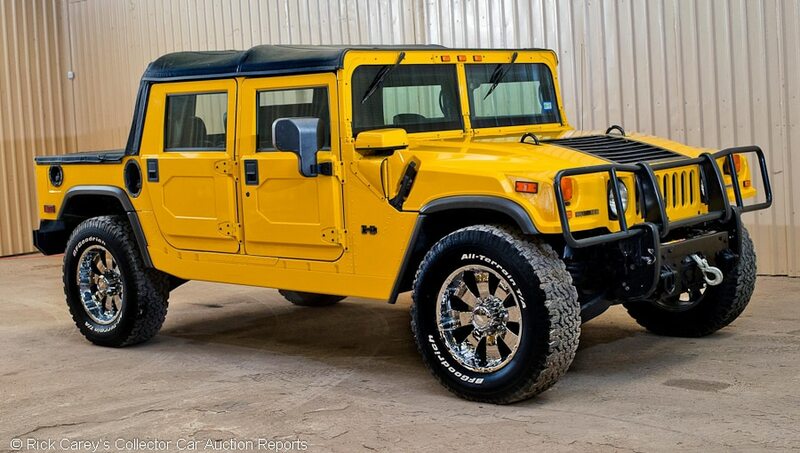 Lot # 70 2006 Hummer H1 Alpha Open Top Utility 4×4; S/N 137PH90316E220607; Yellow/Black, Brown leather; Black top; Unrestored original, 2 condition; Hammered Sold at $168,000 plus commission of 10.00%; Final Price $184,800. No Reserve. – 400/300hp diesel, automatic, winch, All-Terrain T/A tires, power windows, CD stereo. – From the Knies collection. Showing 3,825 miles and like new other than some dirt underneath and light interior wear. – The H1 Alpha was a reworked version of the original civilian Humvee with a more powerful Duramax diesel engine, and 2006 was the only model year with an MSRP of around 130 grand. With their massive size and comically bad fuel economy, the H1 is something of an anachronism on today’s roads, but so are lots of collector cars, and this result suggests that H1s have already achieved collectible status. 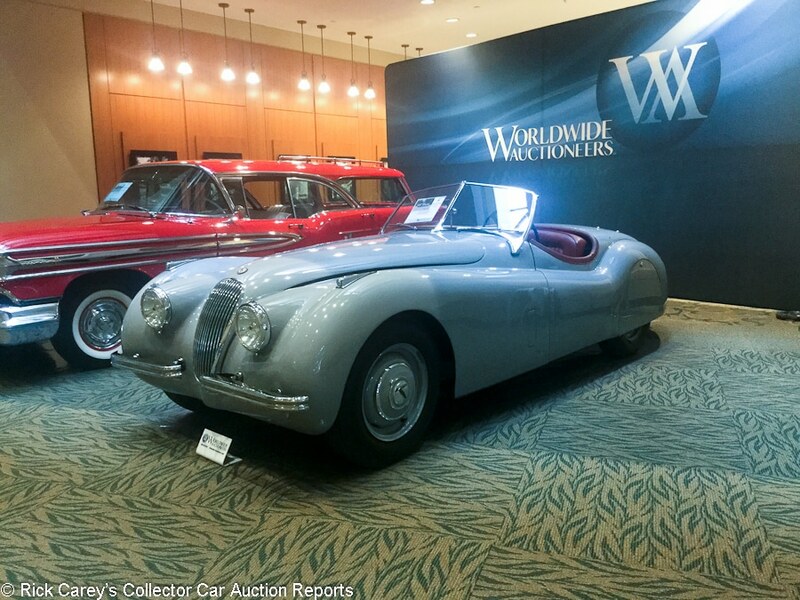 Lot # 10 1952 Jaguar XK120 Roadster; S/N 671814; Engine # W40518; Birch Grey/Red leather; Black top; Older restoration, 2- condition; Post-block sale at $80,000 plus commission of 10.00%; Final Price $88,000. With Reserve. – Hub caps, fender skirts, JDHT Certificate, tools and jack. – US market car represented as matching numbers. Tune up done this year. Small dent on the driver’s door. Imperfect gaps. Light road wear underneath. Good interior. Restored in the early 2000s and aging well. It doesn’t really need anything, but won’t win any trophies at a JCNA event. – The reported high bid isn’t a whole lot more than project car money, so it’s actually something of a surprise that the car moved in this post-block transaction. 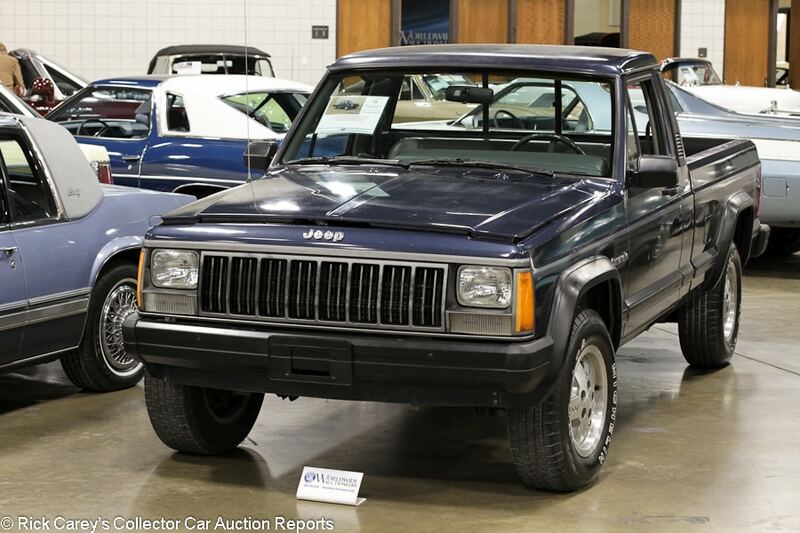 Lot # 72 1989 Jeep Comanche Pioneer Pickup; S/N 1J7FT36L0KL600553; Dark Blue/Gray cloth; Unrestored original, 3 condition; Hammered Sold at $10,000 plus commission of 10.00%; Final Price $11,000. No Reserve. – 242/173hp six, 5-speed, Michelin tires, Pioneer CD stereo, sliding rear window, factory chrome wheels. – From the Knies collection. Showing 104,179 miles and the paint corresponds with that. It’s faded, and there are lots of chips on the front from the highway. There are several big chips around the edge of the bed as well. The interior is much better, with very light wear that is surprising for the mileage. The engine bay is well maintained with new belts and hoses. There can’t be very many of these left, so seeing one even in just decent shape is somewhat special. – These are notoriously rust-prone, making this Comanche’s survival in such sound, original condition noteworthy. The bidders found it to be price-worthy, too, and there’s little or no argument with their conclusion. 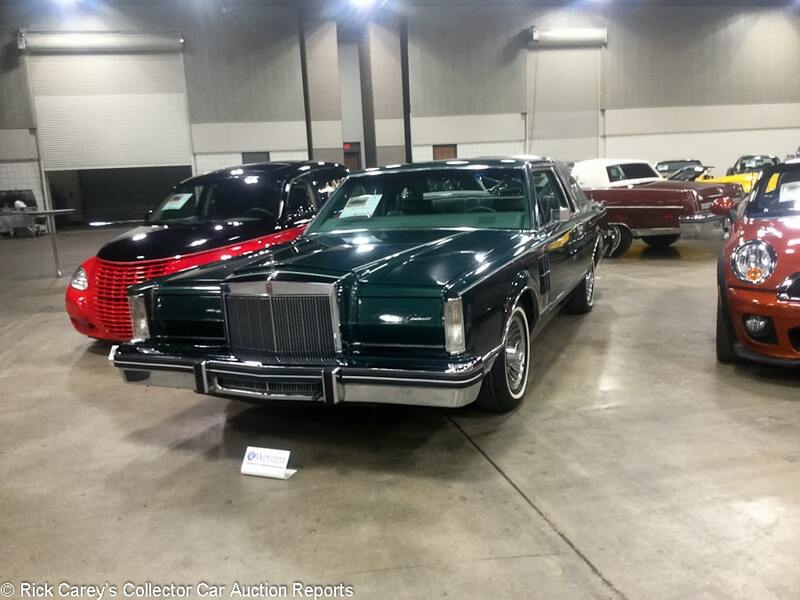 Lot # 76 1980 Lincoln Continental Mk VI 2-Dr. Hardtop; S/N 0Y89G637294; Dark Pine Metallic, Green vinyl roof/Green leather; Unrestored original, 2- condition; Hammered Sold at $11,000 plus commission of 10.00%; Final Price $12,100. No Reserve. – 351/140hp, automatic, 8-track stereo, air conditioning, power windows, power seat, cruise control. – From the Knies collection. Showing 14,077 believable miles. Some light fading on the right front fender but mostly very good original paint. Very tidy underneath. Slight dullness to the top of the roof vinyl but it’s mostly good. Like new interior other than slight wrinkling to the seats. Another one that’s not quite a time warp showroom car, but it’s close and the preservation is very impressive. – And another hefty premium paid for a car thanks to low mileage and despite paint flaws or any other mechanical attention this car might need after sitting in storage for an indeterminate period. 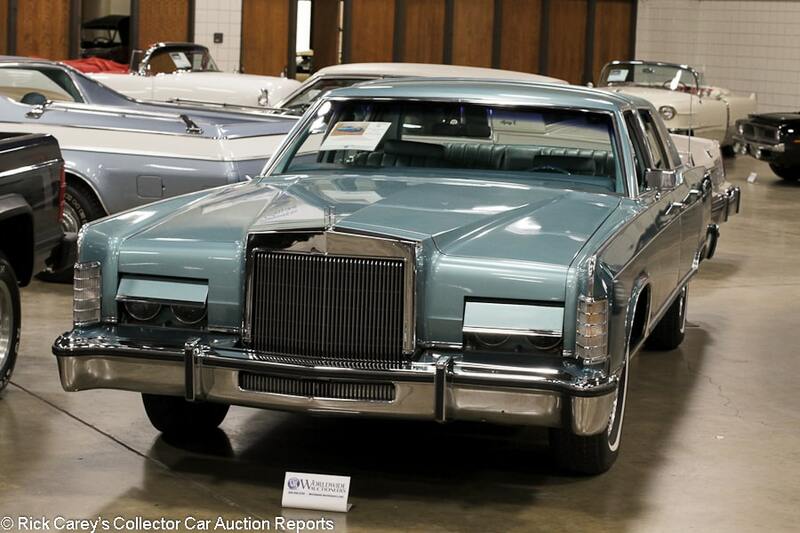 Lot # 73 1979 Lincoln Continental Town Car 4-Dr. Sedan; S/N 9Y82S613953; Teal, Teal vinyl roof/Teal leather; Unrestored original, 2- condition; Hammered Sold at $14,000 plus commission of 10.00%; Final Price $15,400. No Reserve. – 8-track stereo, power seats, power mirrors, power windows, woodgrain dash. – Showing 13,015 believable miles, but not like new. Most of the brightwork is lightly scratched up. The paint is quite good for original, although there is a big chip on the right rear door. The roof vinyl is a little dull. The interior is very good with only very light wear to the seats. Light road wear underneath but maintained. Handsome in these period colors and reasonably well kept, but definitely not perfect. – A hefty premium on the order of 25% or so was paid for the low mileage, but nevertheless still a ton (over two tons, actually) of car for the money and will attract plenty of attention in these colors. 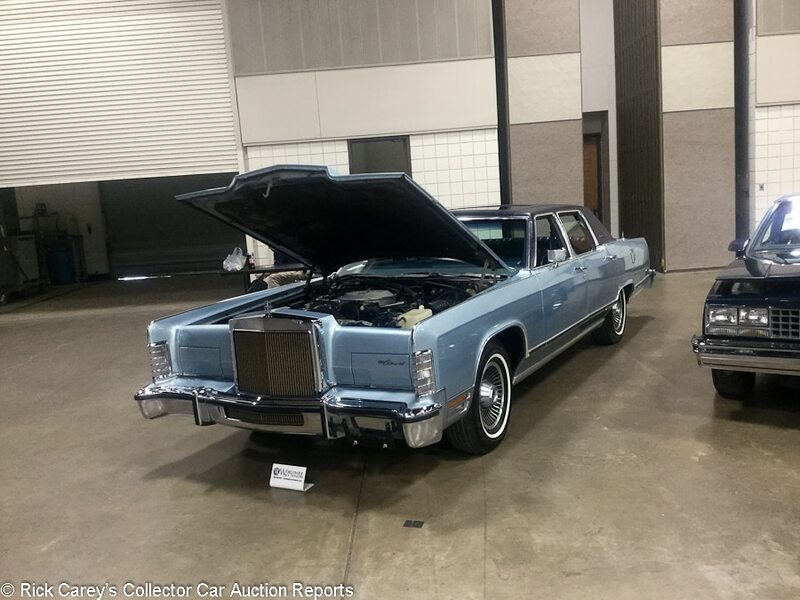 Lot # 75 1979 Lincoln Continental Town Car 4-Dr. Sedan; S/N 9Y82S766711; Light Blue, Dark Blue vinyl roof/Dark Blue leather; Unrestored original, 2- condition; Hammered Sold at $15,500 plus commission of 10.00%; Final Price $17,050. No Reserve. – 8-track stereo, power seats, power mirrors, power windows, woodgrain dash. – From the Knies collection. Some light discoloration behind the front bumper and some light scratches on the front bumper. Big chip at the front of the driver’s door but otherwise excellent original paint. Very good roof vinyl. Excellent like new interior. Like new underneath as well. In roughly the same condition as the other ’79 Continental (Lot 73) even though it has a far lower number of 2,444 miles on the odometer. not perfect, but close to a brand new ’79 Collector Series Continental. 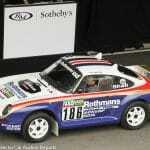 – This is similarly strong money with Lot # 73 for a similarly well preserved car. The extra handful of bids were down to the lower mileage, or perhaps because not everybody is a big fan of the teal color on #73. 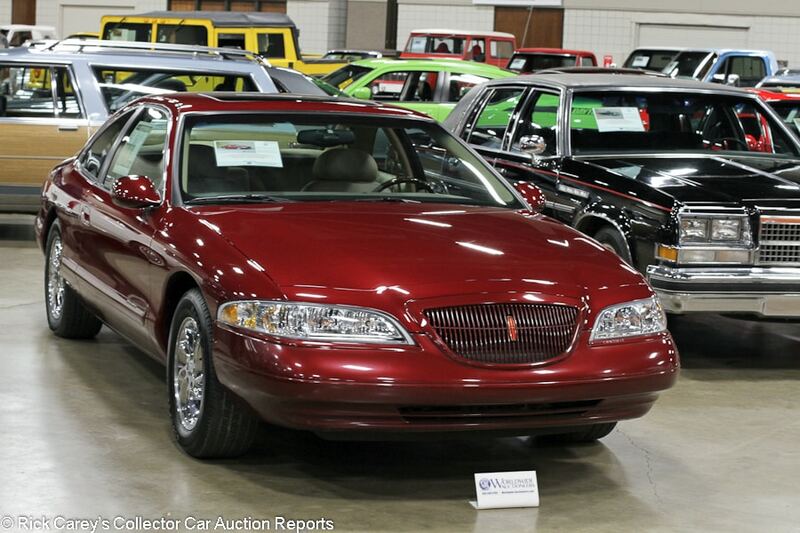 Lot # 37 1998 Lincoln Mark VIII LSC 2-Dr. Hardtop; S/N 1LnFM92V0WY727320; Red/Beige leather; Unrestored original, 2 condition; Hammered Sold at $17,750 plus commission of 10.00%; Final Price $19,525. No Reserve. – 281/290hp, automatic, chrome wheels, sunroof, wood interior trim, cassette stereo, tinted glass, power windows, air conditioning, power seats, window sticker. – From the Knies collection. Showroom fresh with 150 miles. Boring? Yes, at first glance, but that makes this one all the more special and it’s easy to forget that these had the Modular V-8 out of the Mustang. – The Mark VIII died a quiet death in the late 1990s, and was the last of the Lincoln Mark series that dated back to 1970. This is a collector-grade example, and with this mileage it will probably never have more than three digits on the odometer. It brought a huge price, but just about every other example out there is just a used car, so there isn’t much comparison to a showroom fresh one like this. 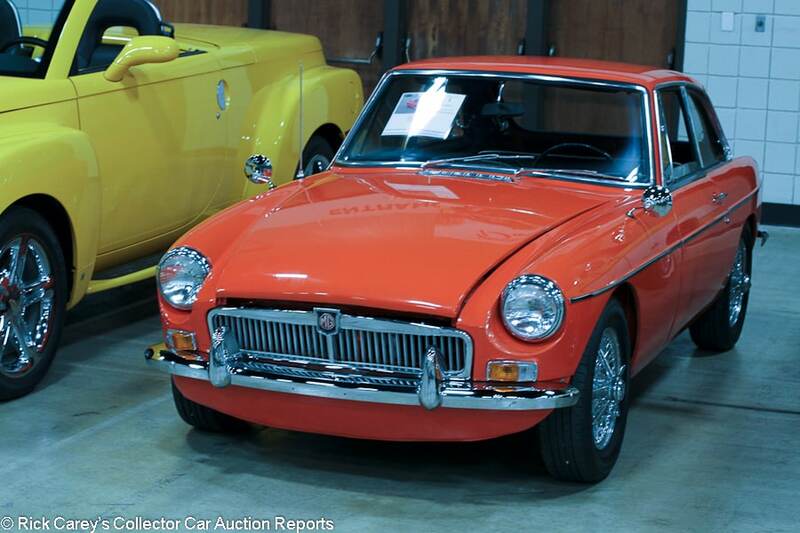 Lot # 1 1967 MG B GT Coupe; S/N 67GH13L117040; Engine # 18V584ZL15065; Orange/Black vinyl piped in Red; Recent restoration, 2- condition; Hammered Sold at $9,000 plus commission of 10.00%; Final Price $9,900. No Reserve. – Centerlock wire wheels, dual mirrors. – Very clean engine bay and tidy underneath. Straight body. Fresh but not particularly high quality paint. Lightly scratched window trim and rear window glass. Very good, lightly worn interior. Pulled out of 30 years storage in 2016 and fully restored to appropriate standards for what it is. – The first car to cross the block at an auction typically doesn’t bring strong money, and that was the case here. As such a fresh car with no needs, it could have brought quite a bit on the other side of 10 grand, even with commission, without being expensive. 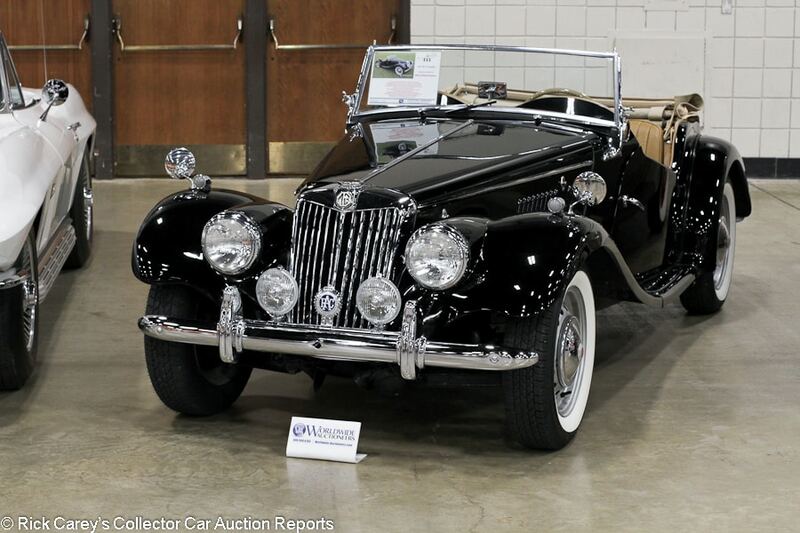 Lot # 111 1954 MG TF Roadster; S/N HDA362255; Engine # XPAGTF31983; Black/Tan leather; Beige cloth top; Older restoration, 2- condition; Hammered Sold at $20,000 plus commission of 10.00%; Final Price $22,000. No Reserve. – 1,250/57hp, hub caps, whitewalls, dual wing mirrors, rear-mounted spare, badge bar, Lucas driving lights, banjo steering wheel. – Originally delivered in Belgium, hence the metric instruments. Very good interior with new seats, carpets and door panels, but the steering wheel and gauges are original. Good older replacement top it there are a few small smudges and the frame is unrestored. Good but not show quality paint and chrome with a small chip on the hood. Fully restored, lightly run engine bay. Body-off restored in 2013 then enjoyed as an MG should be. Attractive and without any needs. – Sold at Barrett-Jackson Scottsdale last year for $23,100 before selling at Leake Tulsa a few months later for $21,725. All seem like bargain results, but this kind of consistency from the buying public is a strong indication at this car’s worth in the marketplace. 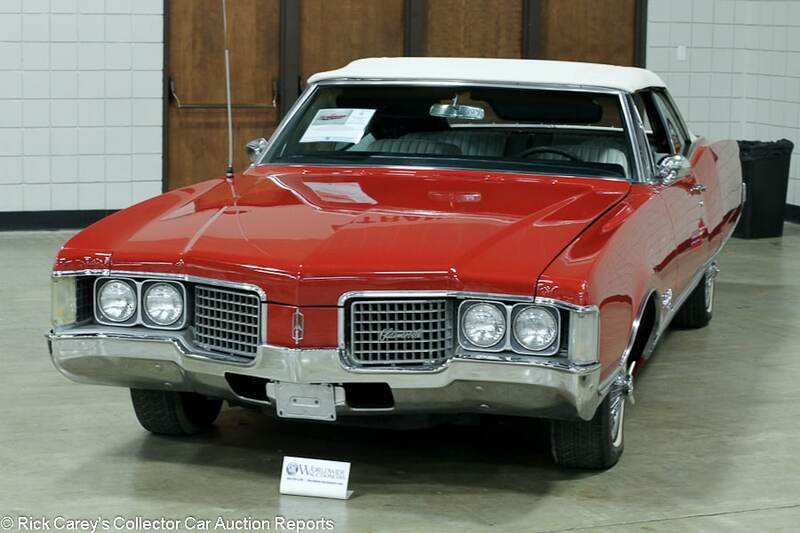 Lot # 35 1968 Oldsmobile Ninety-Eight Convertible; S/N 384678M130082; Red/White leather; White vinyl top; Visually maintained, largely original, 2- condition; Hammered Sold at $9,000 plus commission of 10.00%; Final Price $9,900. No Reserve. – 455/365hp, automatic, wire wheel covers, narrow whitewalls, factory pushbutton radio, power windows, power top, dash clock. – From the Knies collection. Average quality older repaint with some scratches and scuffs on the front. Lightly scratched window frames. Slightly dirty older replacement top, but the top frame has been refinished. Very well kept all original interior with light wear to the seats and some dullness to the dash top. Very well maintained underneath but never fully restored because it never needed to be, and that goes for the rest of the car. – Sold by Mecum at Des Moines in 2011 for $12,190. The result here could have had a “1” in front of it and all that rather generous result would have provoked would have been an observation on preservation premiums. This is a bargain. 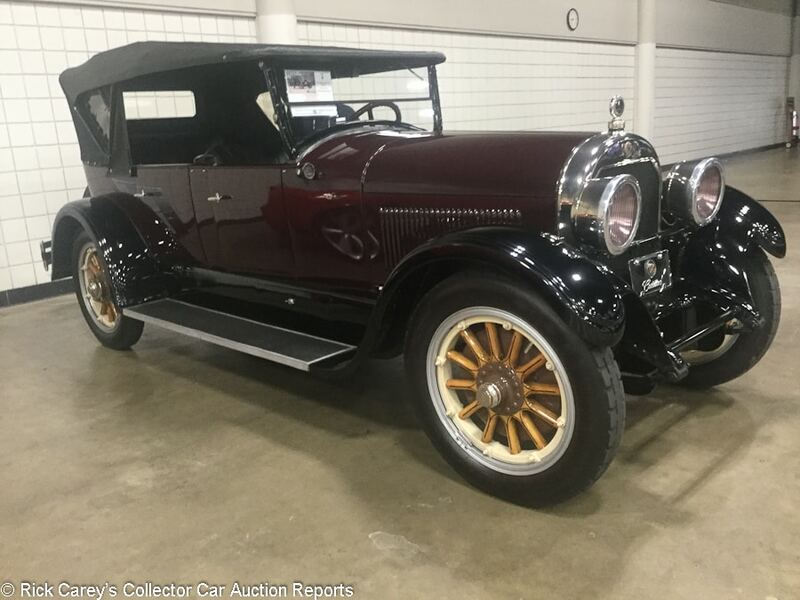 Lot # 25 1929 Packard 640 Custom Eight Phaeton; S/N 174637; Red, Black fenders/Black leather piped in Red; Black cloth top; Older restoration, 2- condition; Hammered Sold at $115,000 plus commission of 10.00%; Final Price $126,500. With Reserve. – Artillery wheels, Firestone wide whitewalls, dual sidemount spares, Goddess of Speed mascot, wood dash, rear luggage rack, suicide rear doors, Jaeger dash clock. – Good but older and not show ready paint and chrome. Older tires. The door gaps are almost even, but not quite. Older underneath and lightly run engine bay. Very good interior. Older but correct and full restoration more suited to driving than doing anything more than showing off in the parking lot after a day’s touring. – This car was sold at Leake’s Tulsa sale ten months ago for $69,850 and rated a very good value at the time. Its odometer has actually unwound a little since then and the observation then that it appeared to be an old restoration, driven, then freshened still applies. 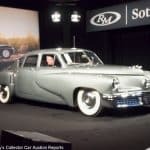 That it changed hands for $57,000 more this year is a recognition of its underlying value, the quality of the aging restoration and its CCCA Full Classic ™ status. 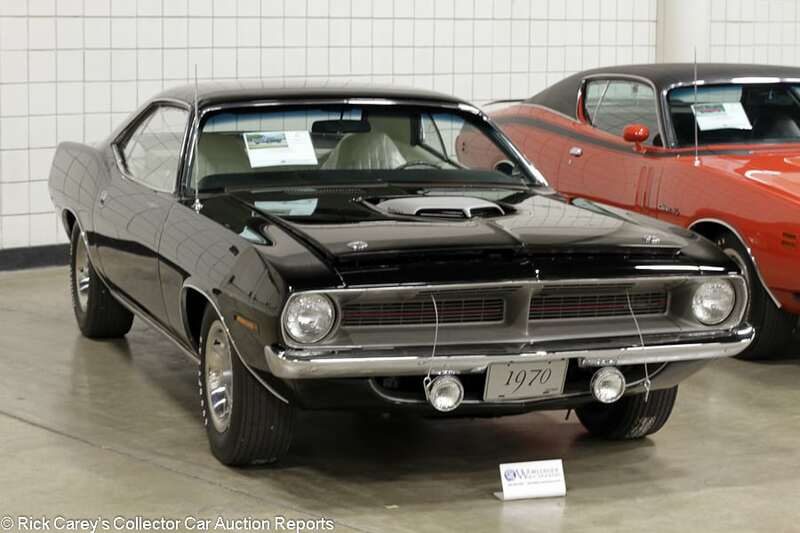 Lot # 11 1970 Plymouth ‘Cuda 2-Dr. Hardtop; S/N BS23V0B242185; Black Velvet/White; Recent restoration, 2- condition; Hammered Sold at $108,000 plus commission of 10.00%; Final Price $118,800. With Reserve. – 440/390hp Six Barrel, 4-speed, Polyglas GT tires, fog lights, hood pins, shaker hood, 4.10 Super Track Pack, Hurst pistol grip shifter, pushbutton AM radio, power steering, power brakes, remote driver’s mirror. – Well-kept but not perfect older paint and chrome. Factory gaps. The rocker trim doesn’t quite fit flush. Some light wear on the driver’s seat but mostly very good restored interior. Restoration finished in 2013 on a claimed genuine matching numbers Six-Barrel car in attractive colors. – Russo and Steele sold this ‘Cuda at Scottsdale in 2015 in a post-block transaction for $140,000 and the result here is representative of values for slightly aged restored ‘Cudas, even with the Six Barrel intake, in the past three years. 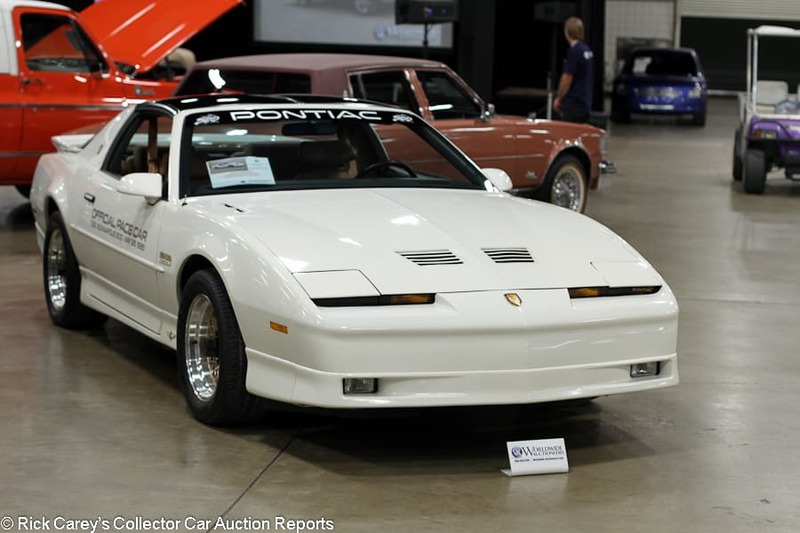 Lot # 48 1989 Pontiac Firebird 20th Anniversary Trans Am GTA Indy Pace Car Coupe; S/N 1G5FW2175KL243604; White, Pace Car graphics/Tan; Unrestored original, 2+ condition; Hammered Sold at $28,250 plus commission of 10.00%; Final Price $31,075. With Reserve. – 3.8 turbo V-6/250hp, automatic, tinted T-tops, cassette stereo, power windows, air conditioning. – From the Knies collection. 902 miles and pampered as a collectible from new. Other than a little flatness on the driver’s seat, it looks showroom fresh and is generally better preserved than most of the other cars out of this collection. – This is a fairly modest result considering the sub-1,000-mile reading on the odometer and the well preserved presentation. Interest has dipped a bit in these Turbo Trans Ams over the past year or so, but this is nevertheless something of a deal. 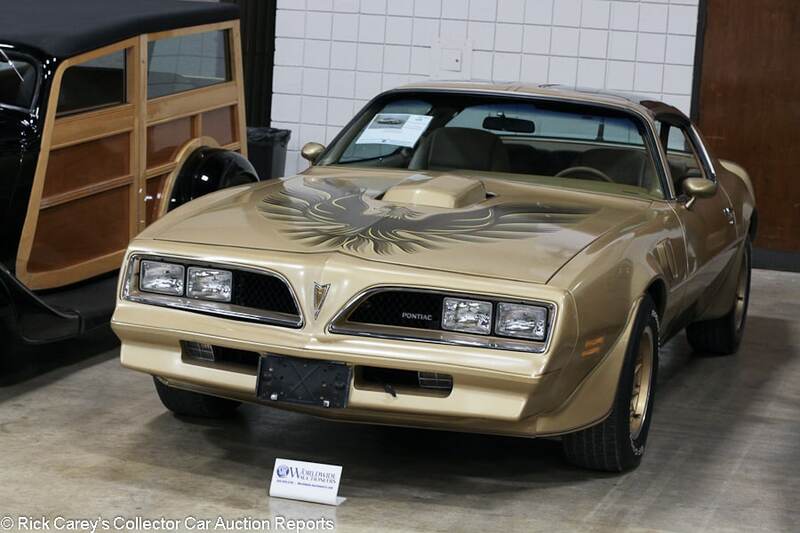 Lot # 110 1978 Pontiac Firebird Trans Am Coupe; S/N 2W87Z8N154580; Gold, Firebird graphics/Beige cloth; Unrestored original, 3+ condition; Hammered Sold at $22,000 plus commission of 10.00%; Final Price $24,200. No Reserve. – 400/220hp, automatic, snowflake wheels, Radial T/A tires, glass T-tops, power windows, pushbutton radio, air conditioning. – From the Knies collection. Something has dripped on the hood and caused a long streak of discoloration across one of the bird wings on the hood. The paint is pretty faded in general. Cracked weather stripping. Some light scratches on the T-tops. Dull but sound engine bay and underbody. A used and driver-quality unrestored Bandit-era Trans Am. – Fully priced given its premium for originality, there isn’t any money left over for restoration work. 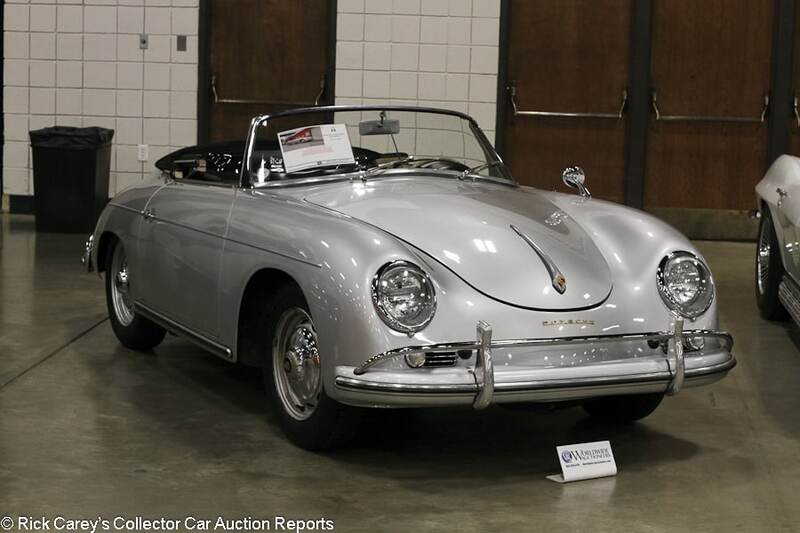 Lot # 23 1959 Porsche 356A Convertible D, Body by d’Ieteren Freres; S/N 86380; Silver/Black leatherette; Black cloth top; Unrestored original, 3 condition; Hammered Sold at $190,000 plus commission of 10.00%; Final Price $209,000. With Reserve. 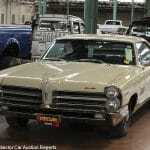 – 1582/60hp, wheel covers, no-name tires, gold brightwork, CoA and Kardex. – One year only Convertible D, which replaced the Speedster. Originally sold to a U.S. serviceman in Germany then shipped to the U.S. in the 1960s. Fairly rough old paint with a few blisters on the front left fender. The body side trim doesn’t fit flush to the body. Old but maintained engine bay. Looks unrestored underneath. Good replacement top. Good seats and carpets, but the interior is lightly shabby. All original and arguably too good to restore since a rust-free original 356 is such a rare find these days. – The Convertible D is a rare and desirable car, fitted from new with many of the comfort upgrades Speedsters have received over the years. They’re not as coveted as Speedsters, but are a realistic alternative. This is a representative price that recognizes the compromises between its condition and originality. There isn’t close to enough left in it at this price to give serious consideration to a restoration. 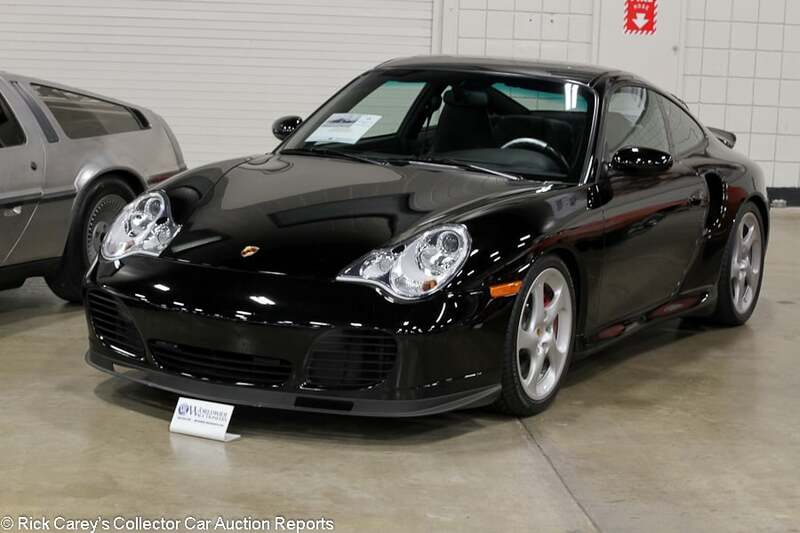 Lot # 15 2003 Porsche 911 Turbo Coupe; S/N WP0AB29923S686983; Engine # 64303502; Black/Black leather; Unrestored original, 2- condition; Not sold at Hammer bid of $60,000. With Reserve. – Red calipers, sunroof, tinted glass. – Two-owner car. Detailing scratches in the paint and numerous small chips on the nose and hood, which really stand out on a black car. notable wrinkling to the seats. For an 18,600-mile 911, this car really should look better as far as paint goes, although it did have a thorough service late last year with new tires fitted, and has a clean CARFAX. – Mechanically quite distinct from the often maligned normally aspirated 996, the Turbo versions have been getting attention over the past couple of years, but as far as where prices are currently, the reported high bid here was plenty for a mostly unremarkable example and could have seen it off to a new home. 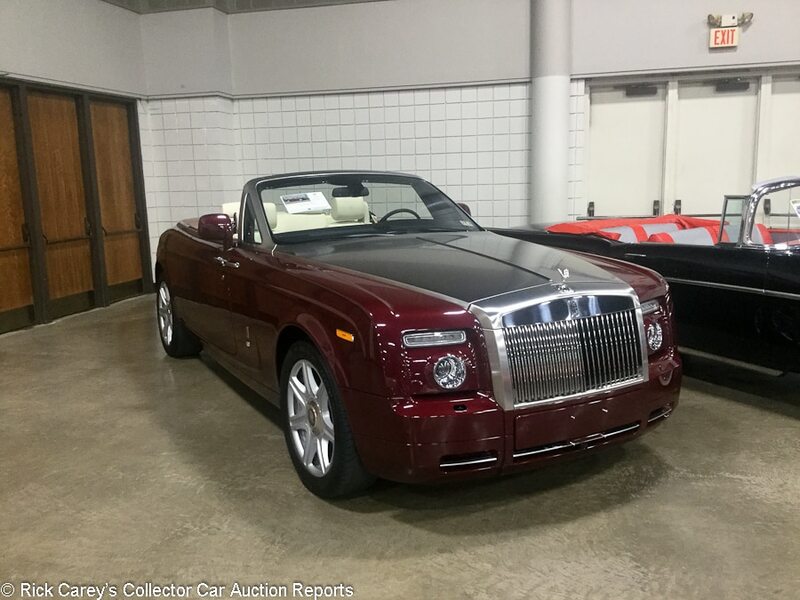 Lot # 41 2010 Rolls-Royce Phantom Drophead Coupe; S/N SCA682D52AUX16422; Burgundy, Brushed steel hood and windshield frame/White leather; Unrestored original, 2- condition; Hammered Sold at $205,000 plus commission of 10.00%; Final Price $225,500. No Reserve. – Dash clock, wood dash and door trim, CD stereo. – From the Knies collection. 2,236 miles. The cover for the right headlight washer is missing. Some light scratches on the brushed steel hood, although they might clear up with a professional cleaning. Light wrinkling to the seats. not quite as good as the age and mileage would suggest, but still as much of an attention-grabbing status symbol as ever. – The Phantom Drophead started at around $450,000 in 2010. For it to have lost half its value on the second-hand market isn’t that surprising given the nature of used Rolls prices, but this still seems like a prudent buy for the new owner, who got what still looks like a contemporary new car at a serious discount. 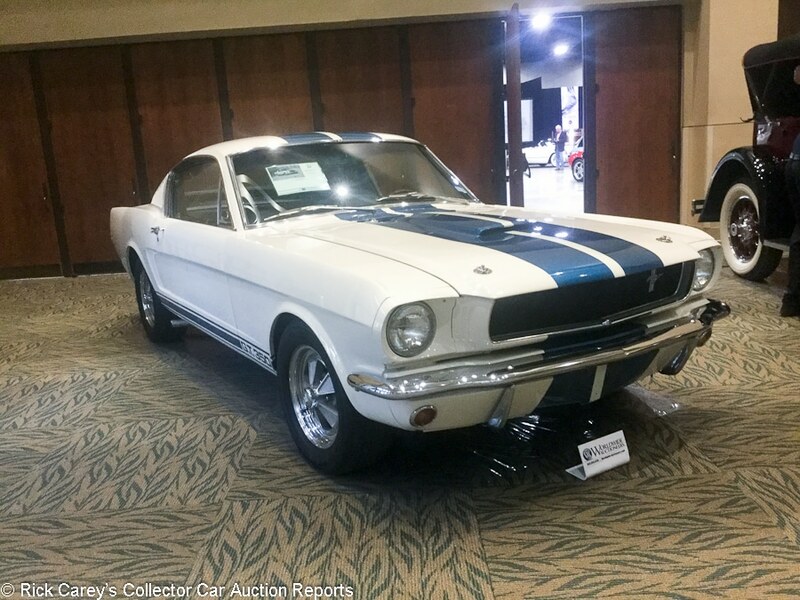 Lot # 22 1965 Shelby Mustang GT350 Fastback; S/N SFM5S482; Wimbledon White, Blue stripes/Black vinyl; Older restoration, 3+ condition; Hammered Sold at $330,000 plus commission of 10.00%; Final Price $363,000. With Reserve. – 289/306hp, 4-speed, 5-spoke Shelby alloy wheels, Kumho tires, dash top gauge cluster, woodrim steering wheel. – Desirable ’65 model. Represented as matching numbers. Very good older paint. The underbody was restored like new and shows a little age and use. Dusty and only superficially prepared for the auction. The interior is sound but gaining some patina. Scuffed windshield and side window trim. Loose trim piece at the bottom of the windshield. Definitely not perfect, but has no major needs. – Reported sold at Worldwide Scottsdale back in January for $352,000. This similar result is another reasonable balance between the innate collectability of the car and the age of its restoration. One might reasonably wonder about why it was flipped on a hammer bid only $10,000 more than three months ago, but both results are reasonable for its history and the age of the restoration. 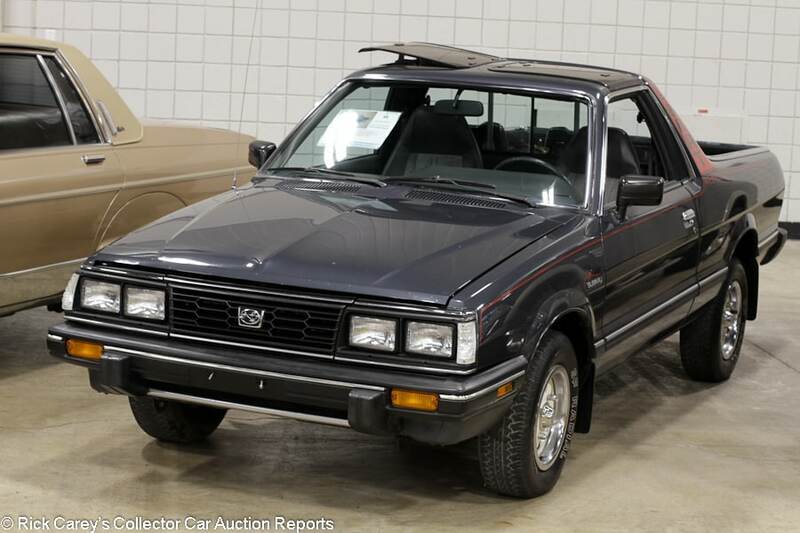 Lot # 95 1987 Subaru Brat (Truck) GL Pickup 4×4; S/N JF3AU53B4HE500452; Dark Gray/Gray vinyl, cloth; Unrestored original, 3 condition; Hammered Sold at $16,000 plus commission of 10.00%; Final Price $17,600. No Reserve. – T-Tops, cassette stereo, air conditioning, aftermarket speakers. – From the Knies collection. Showing 27,361 miles, but far from perfect. Lots of chips on the hood. Plenty of road wear on the hood. The gimmicky rear-facing seats are a little rough, but that’s half the charm of the Brat anyway. Well-kept interior. You hardly see these in any kind of condition, so this car is a treat. – The Brat (Bi-drive Recreational All-terrain Transporter) had its backward-facing and dangerous-looking rear seats in order to qualify it as a passenger car rather than a light truck for tax reasons, and introduced America to Subaru all-wheel drive a generation before it became the chosen brand of hikers and college professors. This was a huge price for one, but there are hardly any left in anything resembling decent condition, so this was a rare opportunity and will have to be marked down as a market-defining transaction. 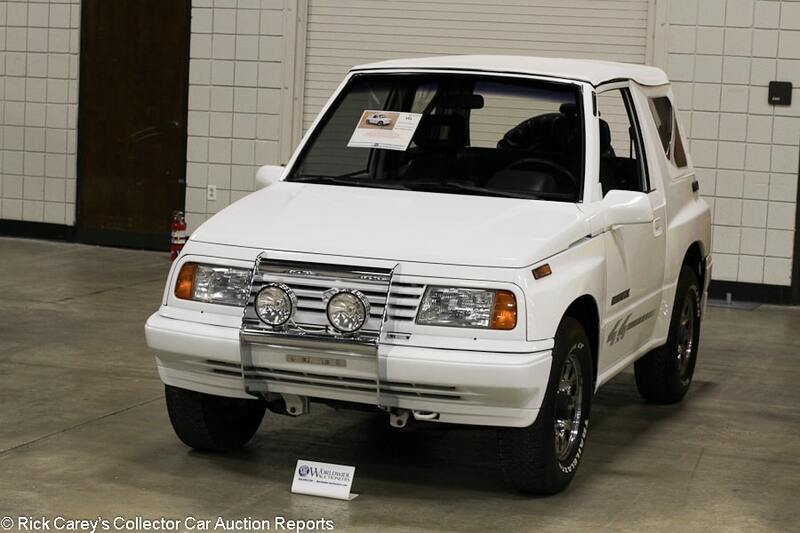 Lot # 101 1995 Suzuki Sidekick JX Utility; S/N 2S3TA02C0S6416305; White/Gray cloth; White vinyl top; Unrestored original, 3+ condition; Hammered Sold at $4,400 plus commission of 10.00%; Final Price $4,840. No Reserve. – Dual-range all-wheel drive, fog lights, aftermarket Sony CD stereo. – From the Knies collection. Some rips in each front seat but otherwise really good interior. Good original paint with some small chips in the nose and mirrors. Some scratches on the tail. Tidy underneath with road wear that corresponds with the 55,188 miles showing. Used, but well cared for. – More commonly seen here with a Geo Tracker badge, the Sidekick hasn’t been a common sight on the road for 20 years. That doesn’t necessarily make something collectible, though, and this thing only attracted a handful of bids. 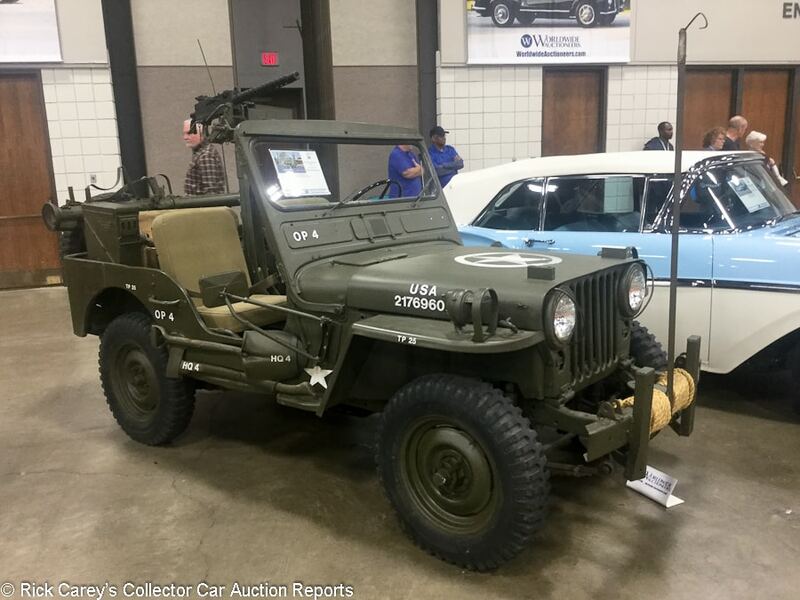 Lot # 28 1951 Willys CJ-3A 1/4 Ton Jeep Universal; S/N MC12676; Green/Green canvas; Older restoration, 3+ condition; Hammered Sold at $17,000 plus commission of 10.00%; Final Price $18,700. No Reserve. – Machine gun and bazooka, rear-mounted spare. – A little dirty top to bottom. Smudges on the seats. Road wear underneath. Restored in authentic military presentation and with all the appropriate accessories. Looks to have been done quite some time ago, but the signs of use just make it look more authentic. – Purely for fun, although it would make a highly unusual snowplow with a blade on the front and the armament in the back (“It’s $75 to plow your driveway. Pay me now or I’ll perforate your garage with the Fifty.”) The result here is appropriate for its condition and the armament.